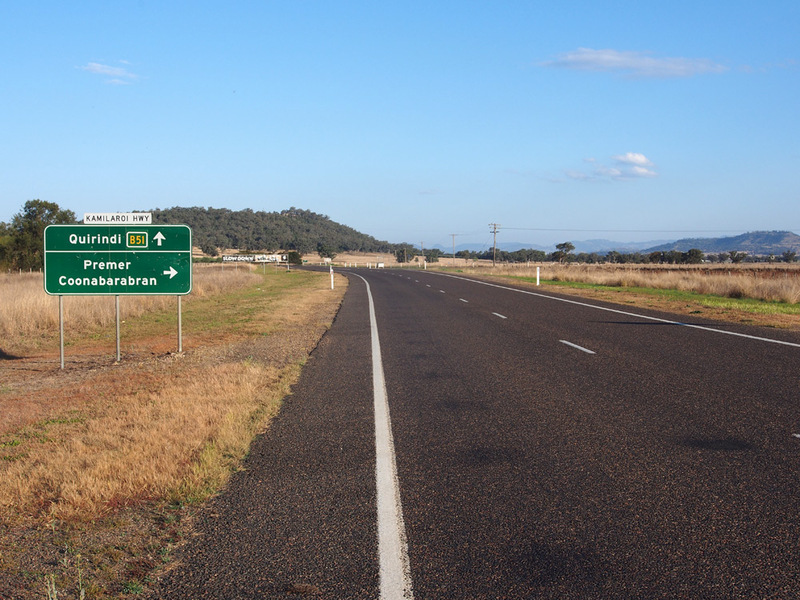 RD sign southbound on Kamilaroi Highway after the junction with Newell Highway, Narrabri West. Source: Peter Renshaw, September 2013. 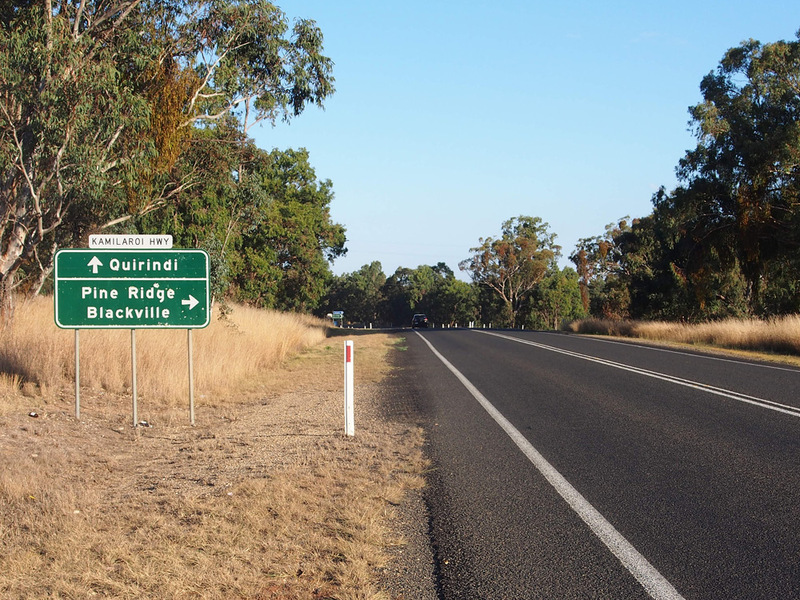 Route B51 is a northwest to southwest route in central northern New South Wales, connecting the New England Highway with the Liverpool Plains, Gunnedah Basin and beyond. 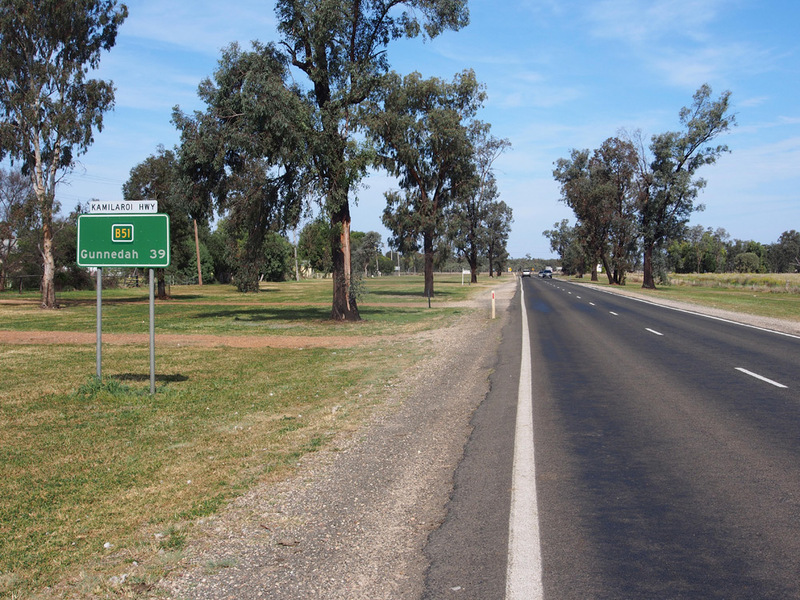 It follows a portion of the Kamilaroi Highway between Willow Tree and Narrabri West. 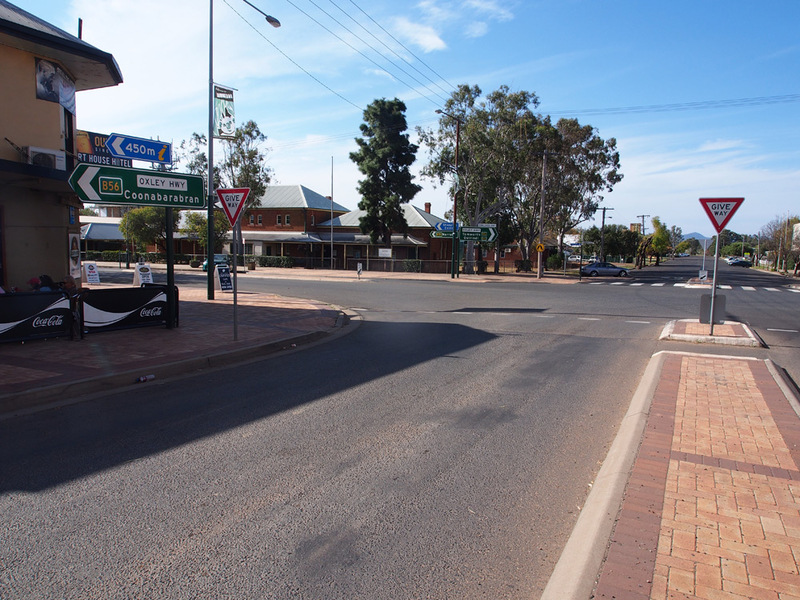 B51 replaced part of the former National Route 37, which originally extended only from Willow Tree to Narrabri West, prior to its poorly signed extension to Bourke in 1999. The current route of B51 pays homage to the original NR37. 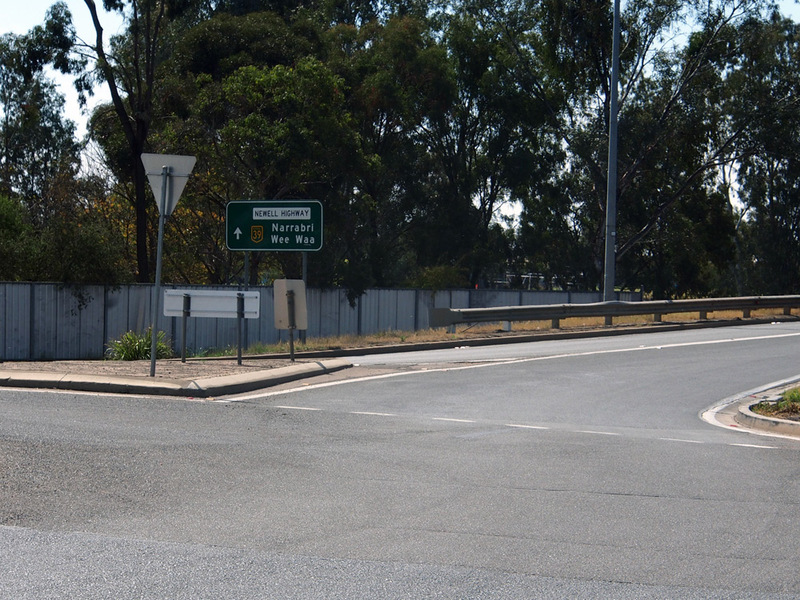 The only alpha-numeric-ready signage installed on this route prior to 2013 was at the Newell and New England Highway junctions at either end of the route. The remainder of the signs were either coverplated or had supplementary plates installed during early-mid 2013 as B51 was rolled out. Much of the signage along the route is rather dodgy, typical of the terrible signage which infected RMS' Northern Region during the 1990s. 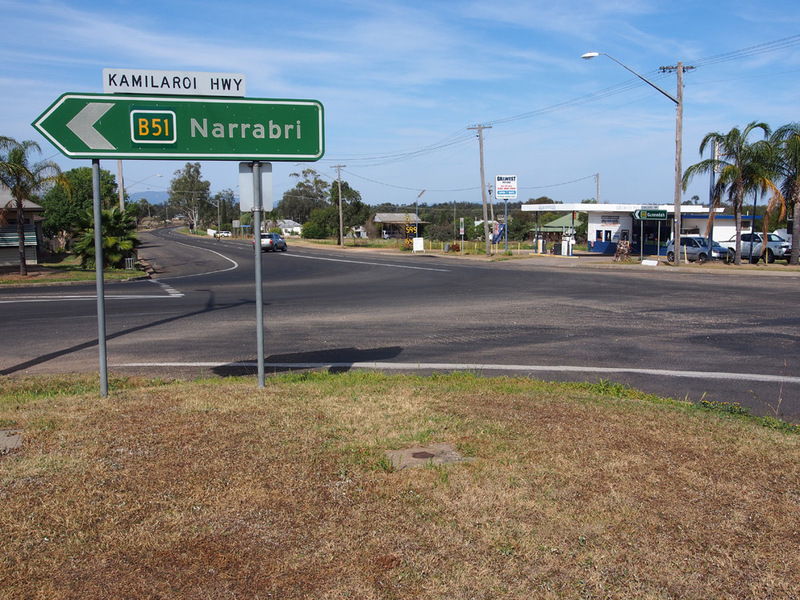 Most signs have the 'Kamilaroi Highway' name plate stuck on top, as the signs pre-date the highway's declaration in 1999. 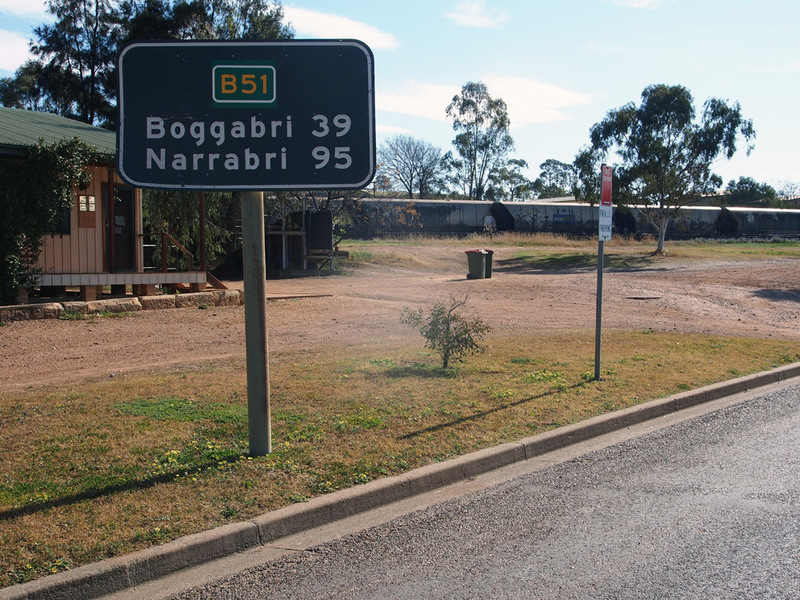 Many signs were also missing the National Route 37 - a problem that has largely been overcome in the rollout of B51. 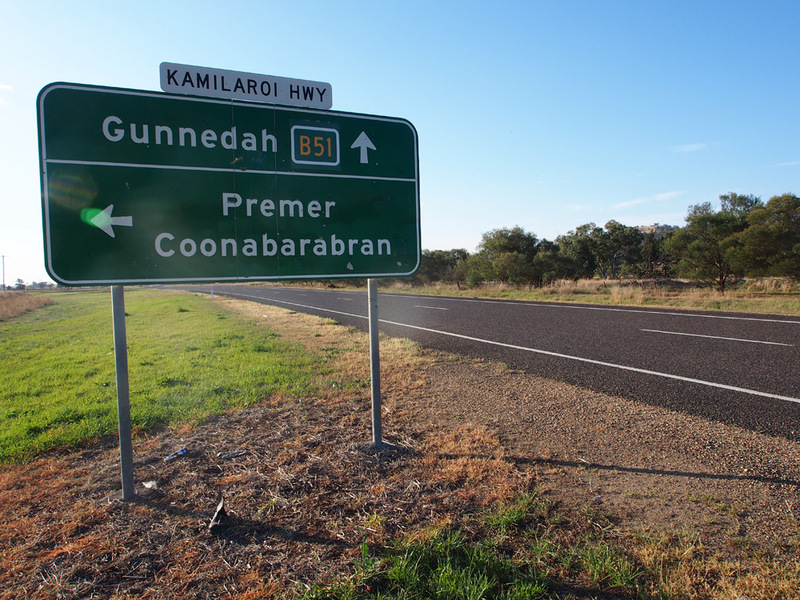 AD signs northbound and southbound on the New England Highway approaching the junction with Kamilaroi Highway, 2km north of Willow Tree. 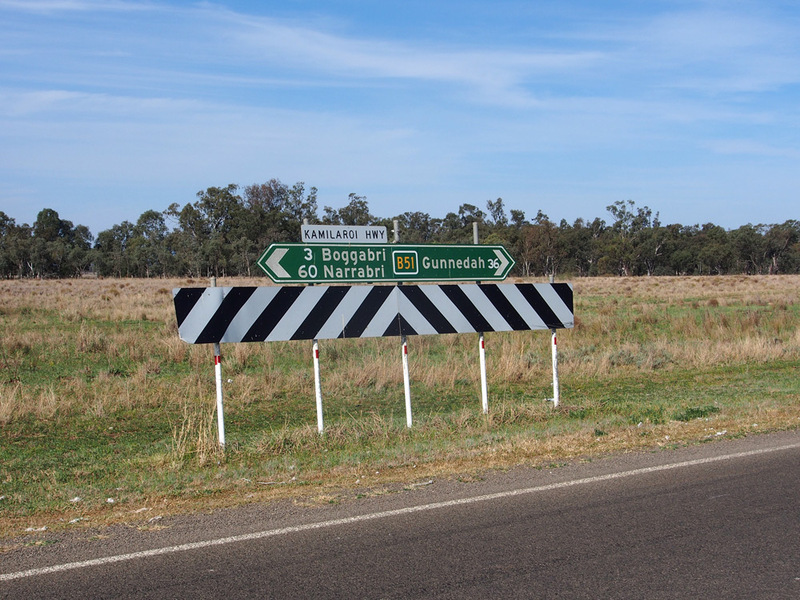 B51 ID signs at the junction of New England Highway & Kamilaroi Highway, 2km north of Willow Tree. 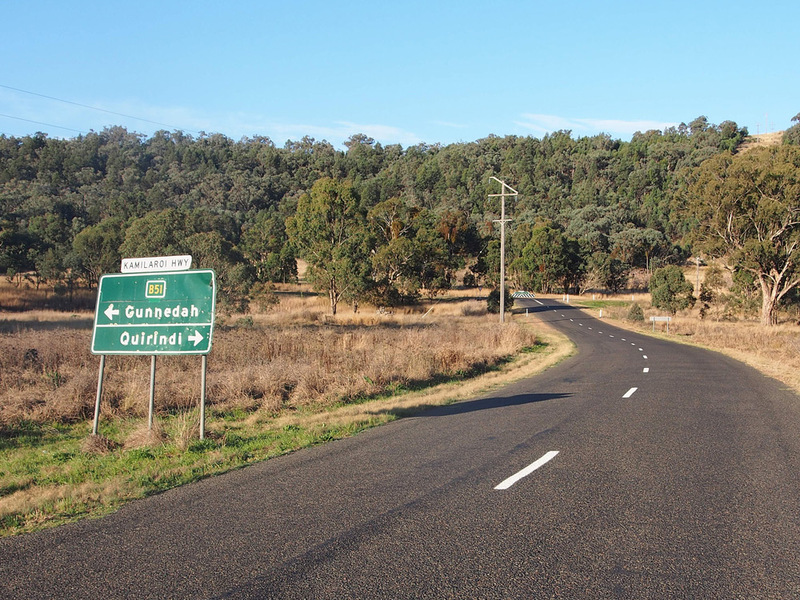 Prematurely exposed A15 route marker on an ID sign at the junction of New England Highway & Kamilaroi Highway, 2km north of Willow Tree. Since this photo was taken, the lower sign has been removed, as have the NR37 ID signs. 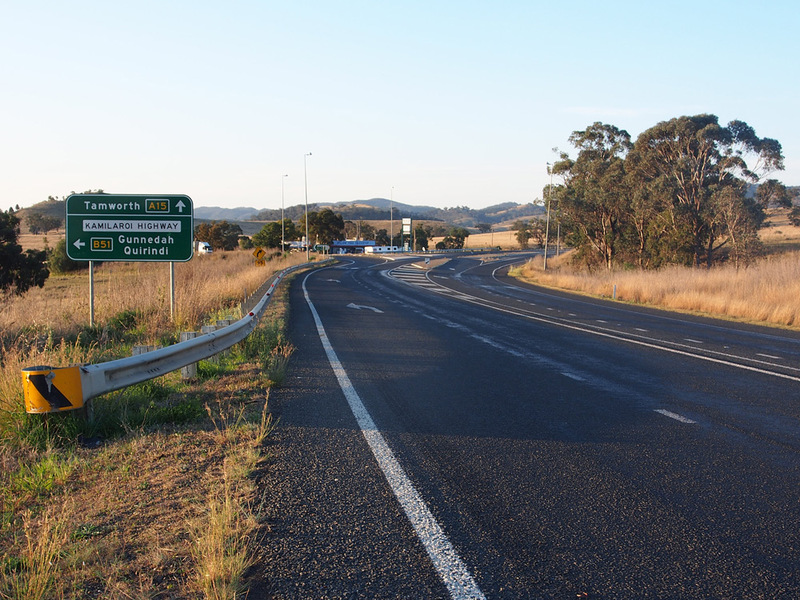 AD sign southbound on Kamilaroi Highway approaching the junction with New England Highway at the southern terminus of route B51. 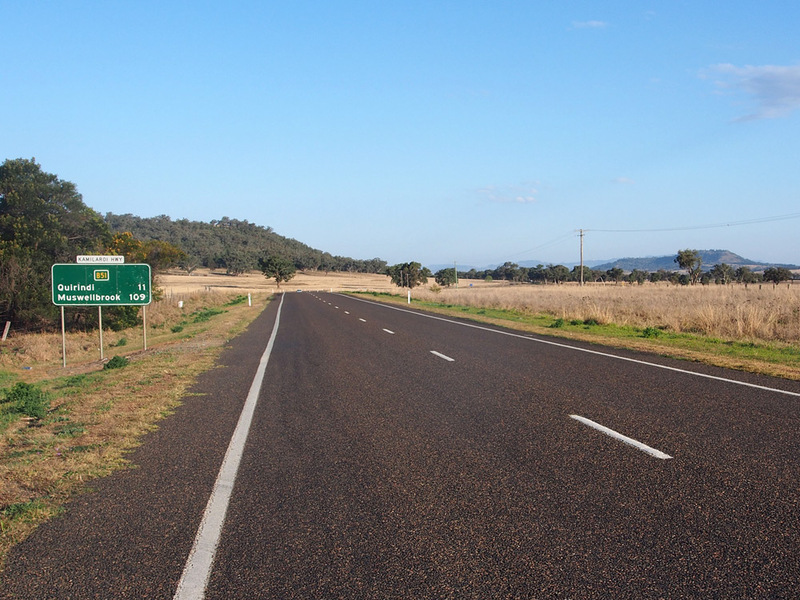 Looking south along Kamilaroi Highway approximately 1km north of the New England Highway junction. 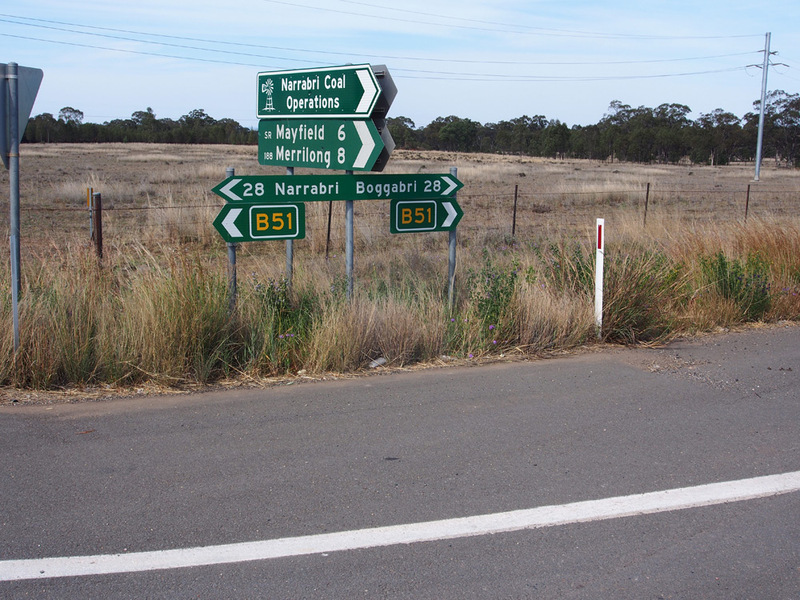 As of September 2013, there is no northbound RD sign for B51 - only this slightly dodgy RD sign for Tourist Drive 25 which, strangely, seems to not be signed at the New England Highway junction. 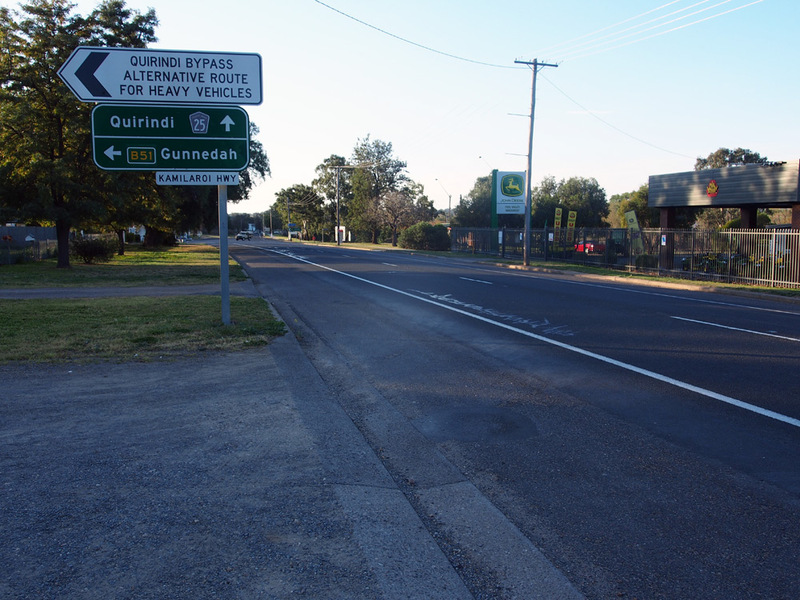 Southbound RD sign on Kamilaroi Highway after the junction of Loder & Lennox Streets in Quirindi. 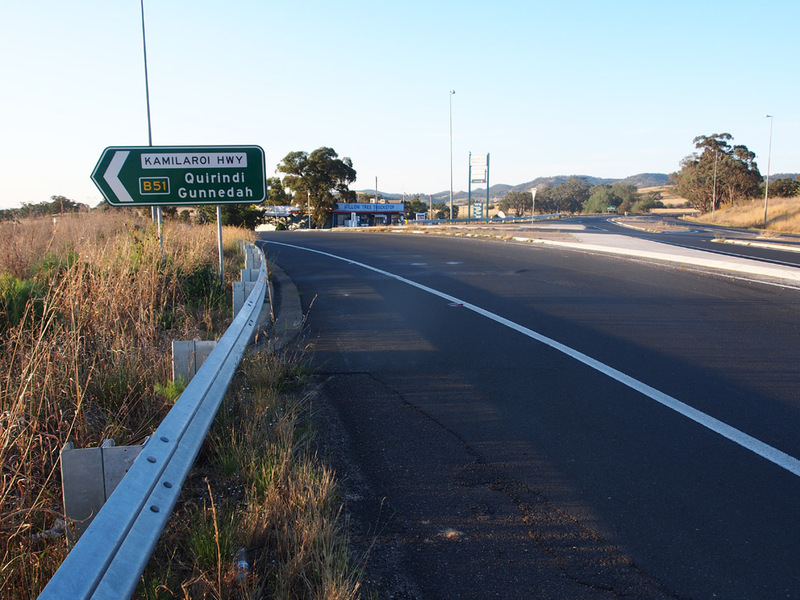 AD sign northbound on Kamilaroi Highway (Loder Street) approaching the junction where the highway turns left onto Lennox Street in Quirindi. 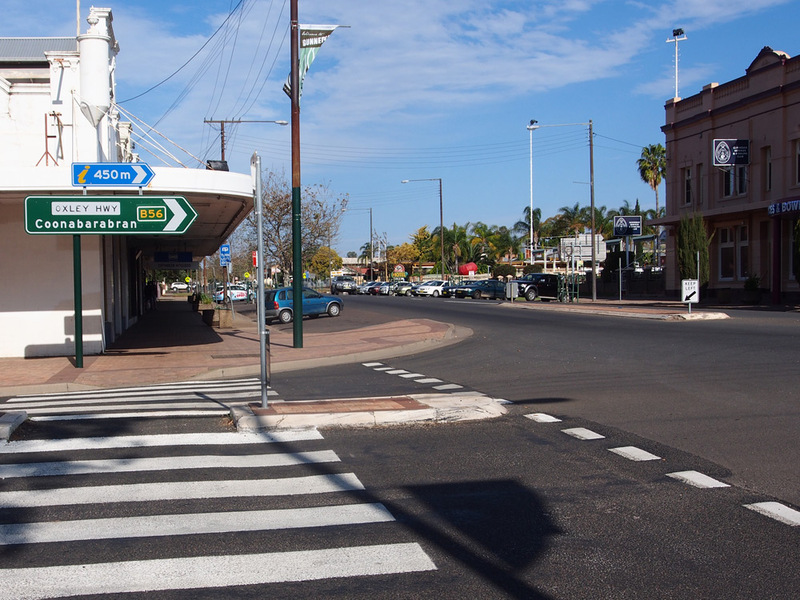 ID sign assembly at the junction of Lennox & Loder Streets, Quirindi. 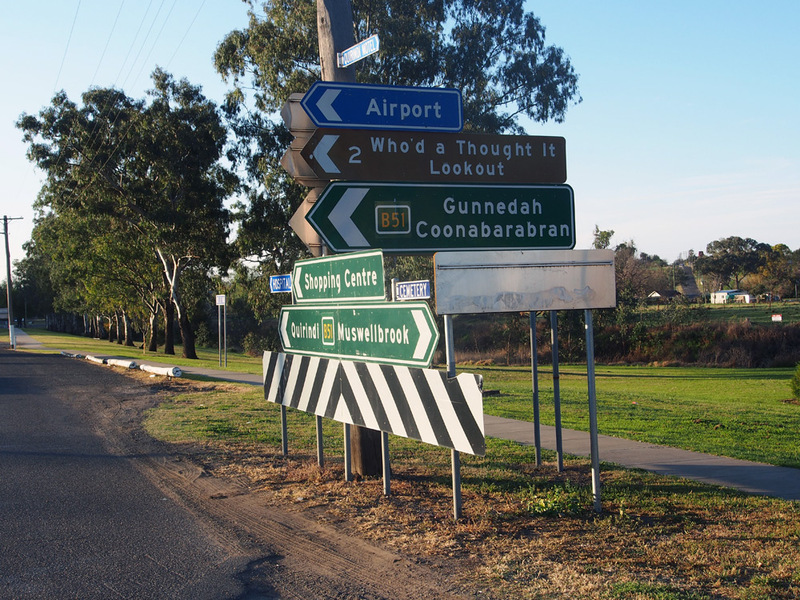 Note how sun damaged the southbound ID sign for the lookout is - the standard brown material used for tourist signs in NSW seems to do this after 12-15 years of direct exposure to the sun. 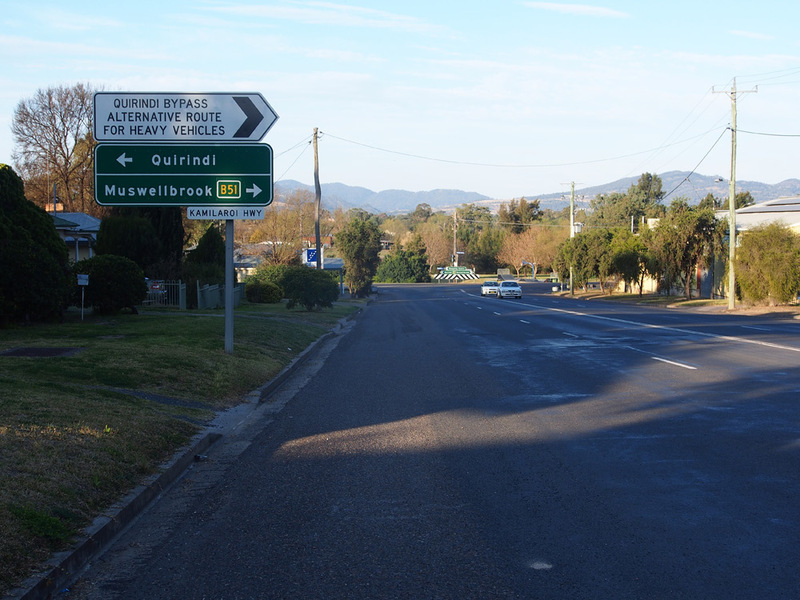 AD sign southbound on Loder Street, Quirindi, approaching the junction with Kamilaroi Highway. Note the TD25 topknot has the same problem as the ID sign above. 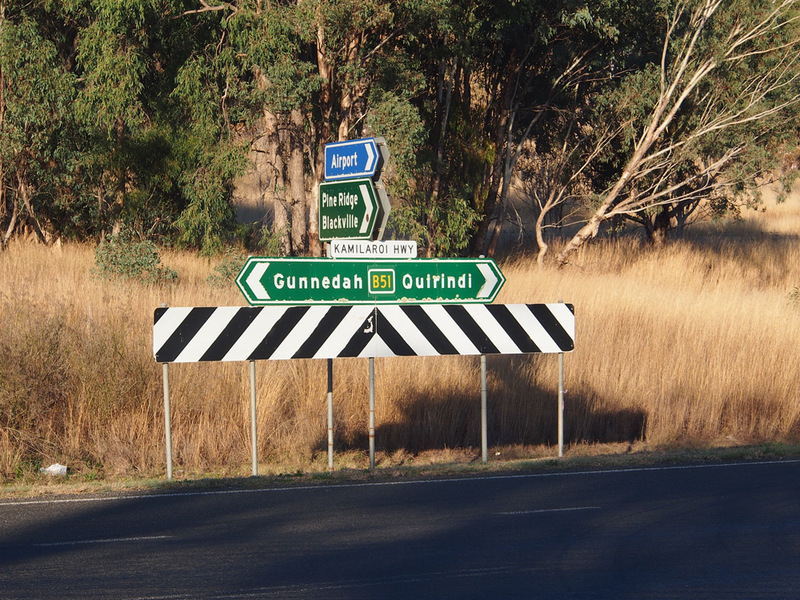 AD sign southeastbound on Kamilaroi Highway (Lennox Street) approaching the junction with Loder Street, Quirindi. 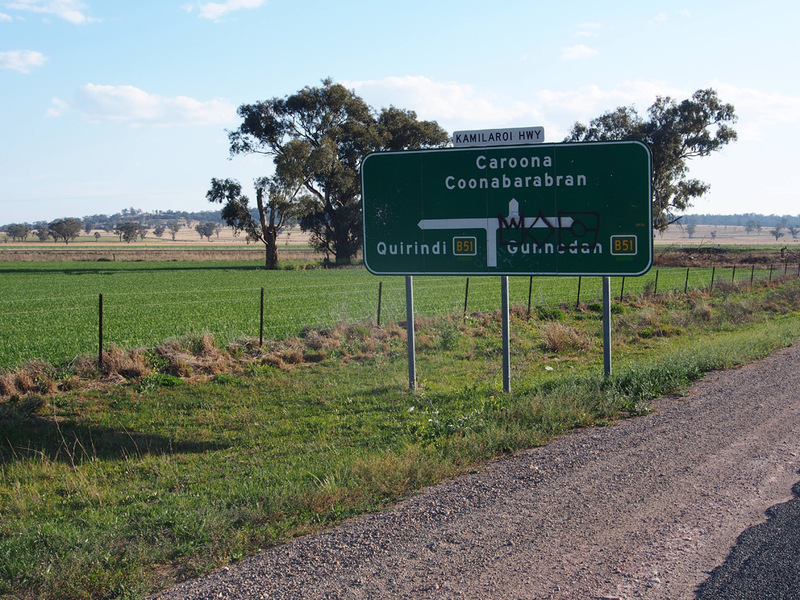 Note the supplementary plate with the road name on it - this and many other signs along the route pre-date the naming of Kamilaroi Highway in 1999, let alone the alpha-numeric route numbering scheme. 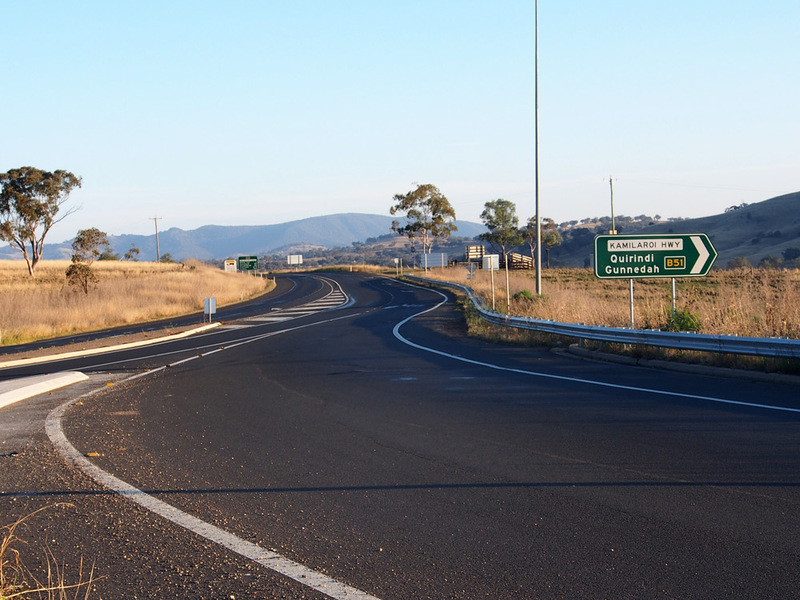 RD sign northwestbound on Kamilaroi Highway (Lennox Street) as you climb out of Quirindi, directly into the late afternoon sun. 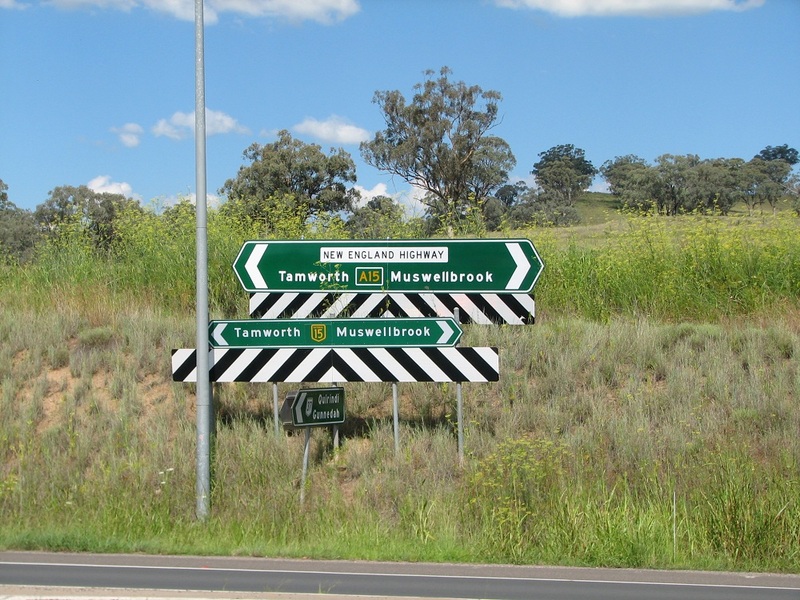 Coverplated fingerboard sign assembly at the junction of Kamilaroi Highway & Warrah Ridge Road, 3km northwest of Quirindi. Topknots have been affixed to this dodgy fingerboard sign assembly which was missing the NR37 shield. 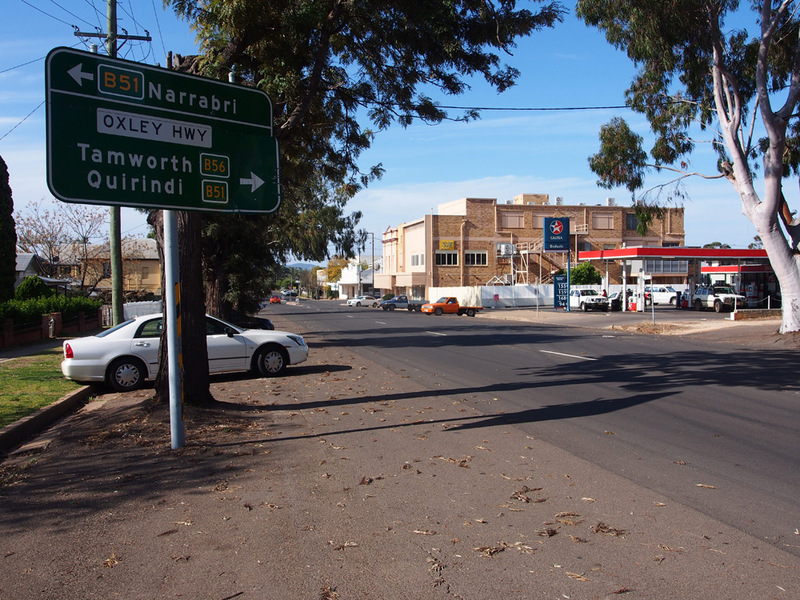 Kamilaroi Highway/Borambil Road intersection, 5km north of Quirindi. 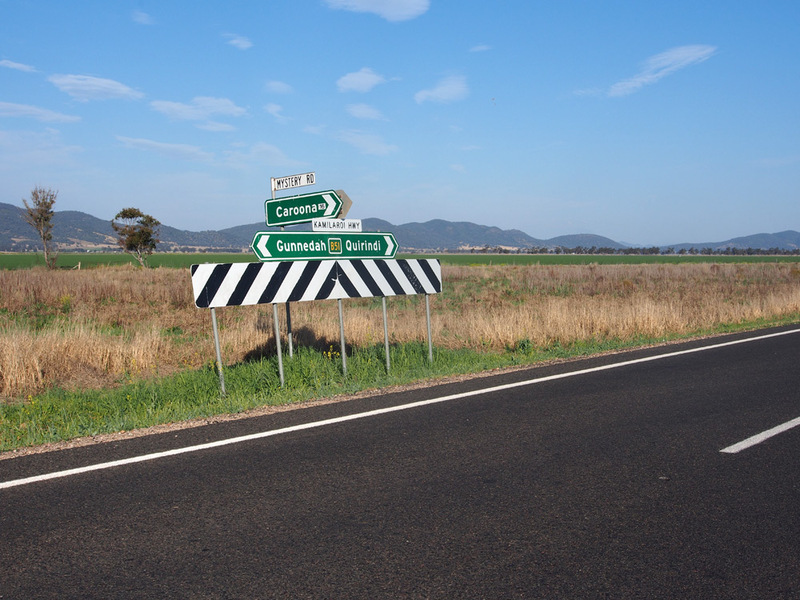 Coverplated dodgy RD sign southbound on Kamilaroi Highway after the junction with Bundella Road, 8km north of Quirindi. They missed one! 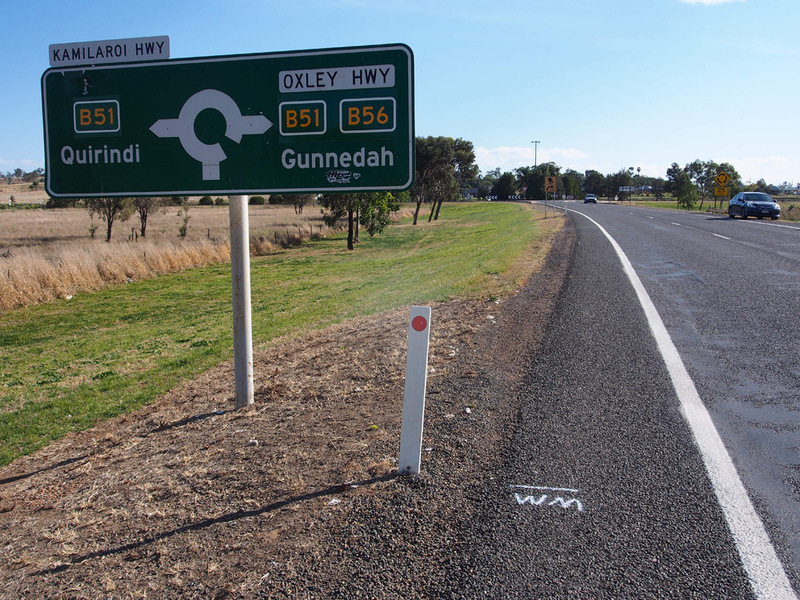 This dodgy AD sign was missing a NR37 shield and is now missing a B51 route marker; northbound approaching the junction with Bundella Road, 8km north of Quirindi. 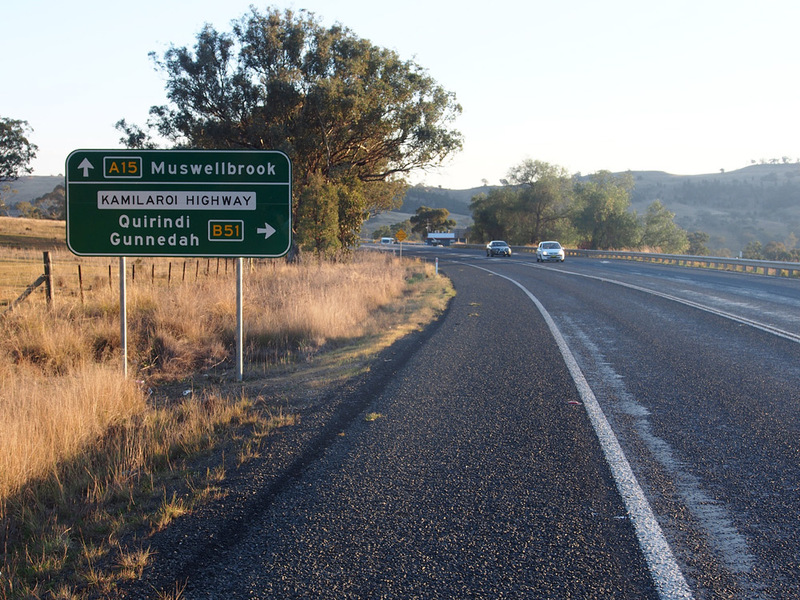 Dodgy coverplated AD sign eastbound on Bundella Road approaching the junction with Kamilaroi Highway, 8km north of Quirindi. Despite the advice of this dodgy sign, B51 does indeed go both ways. 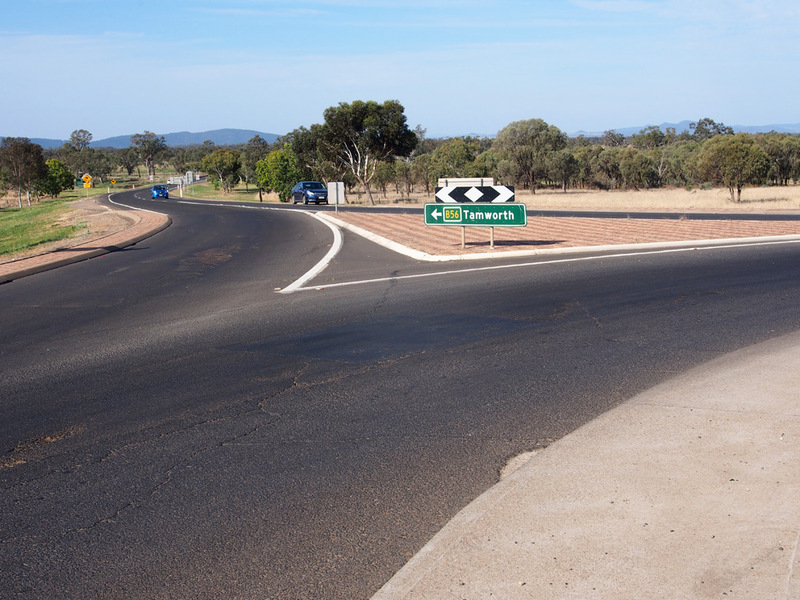 Ageing, but perfectly adequate, ID sign assembly at the junction of Kamilaroi Highway & Bundella Road, 8km north of Quirindi. 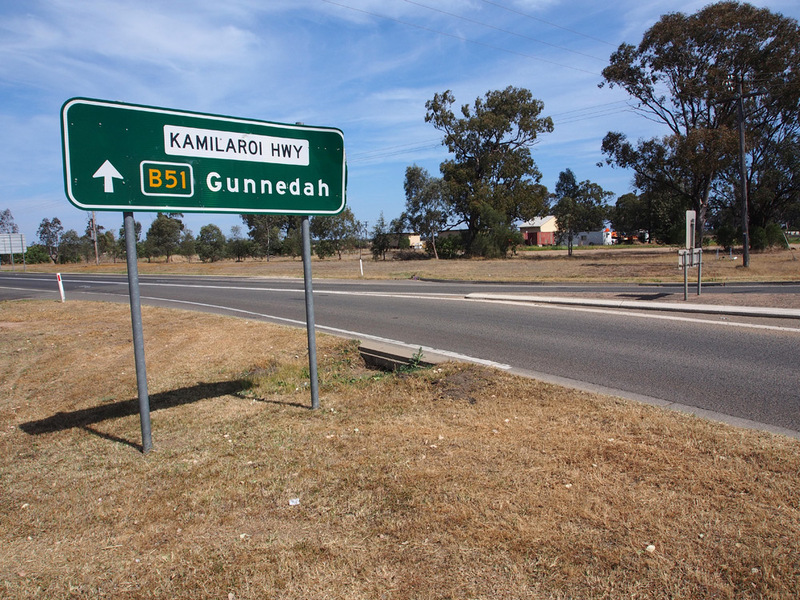 Another missed sign - this AD sign is southbound on Kamilaroi Highway approaching the junction with Bundella Road, 8km north of Quirindi. 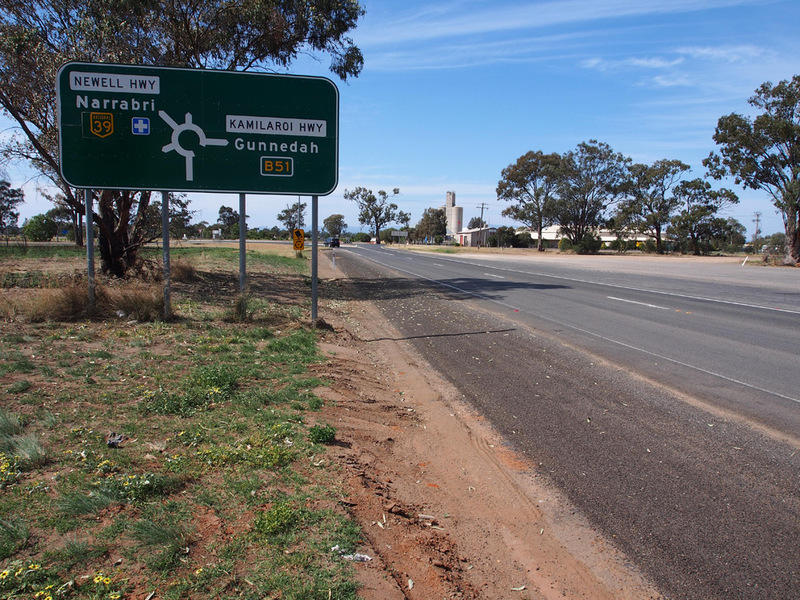 The Kamilaroi Highway has some seriously horrid signage so hopefully the alpha-numeric route numbering scheme is the catalyst for a heap of decent new signs to be installed. 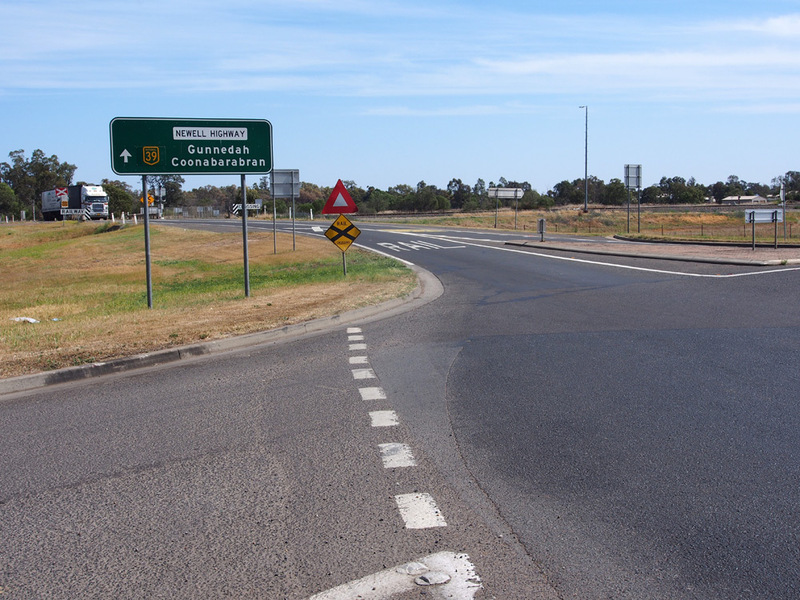 Coverplated RD sign northbound on Kamilaroi Highway after the junction with Bundella Road. 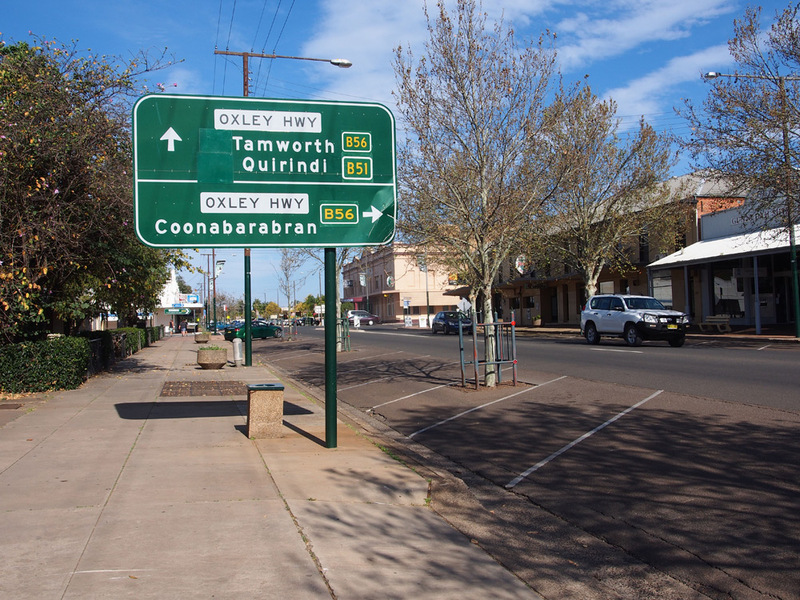 Note the omission of Coonabarabran which was shown on the previous RD sign - hopefully when these signs are all replaced, RMS get the focal point signage consist (one can hope?). 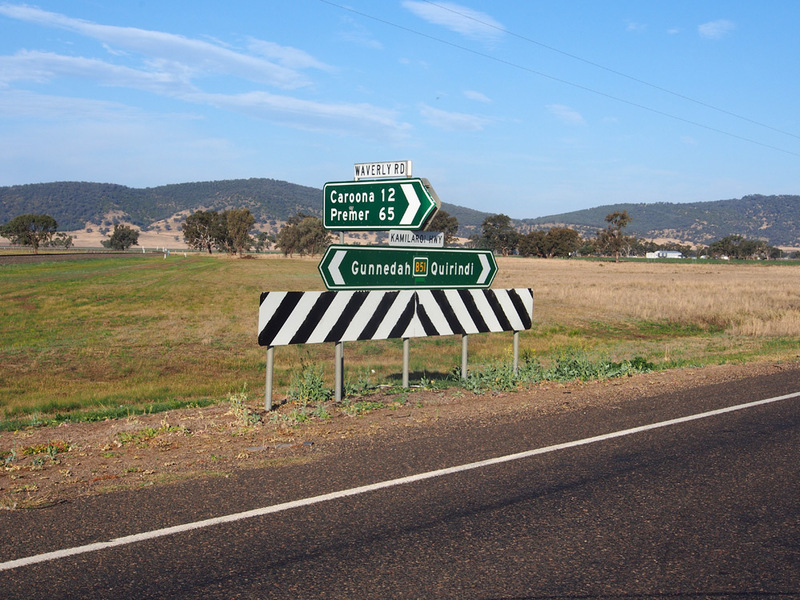 Dodgy coverplated RD sign southbound on Kamilaroi Highway after the junction with Coonabarabran Road, 11km north of Quirindi. 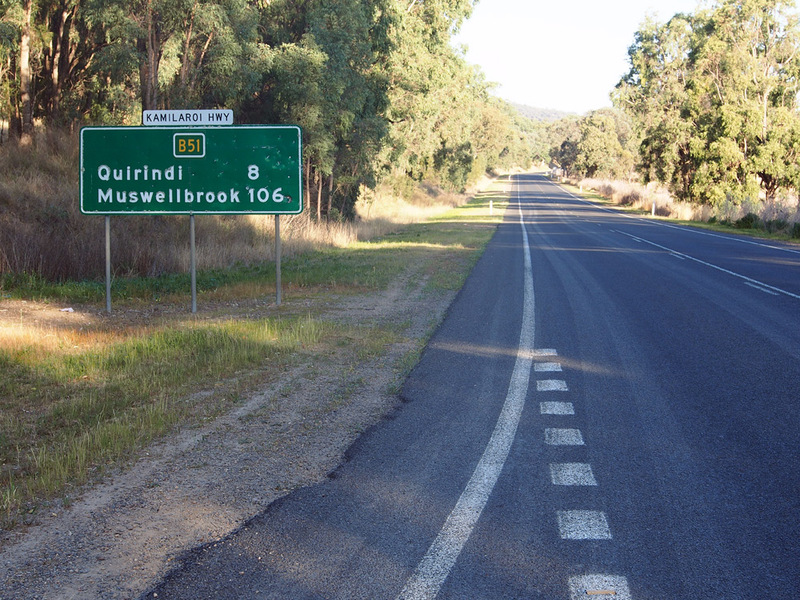 AD sign northbound on Kamilaroi Highway approaching the junction with Coonabarabran Road, 11km north of Quirindi. 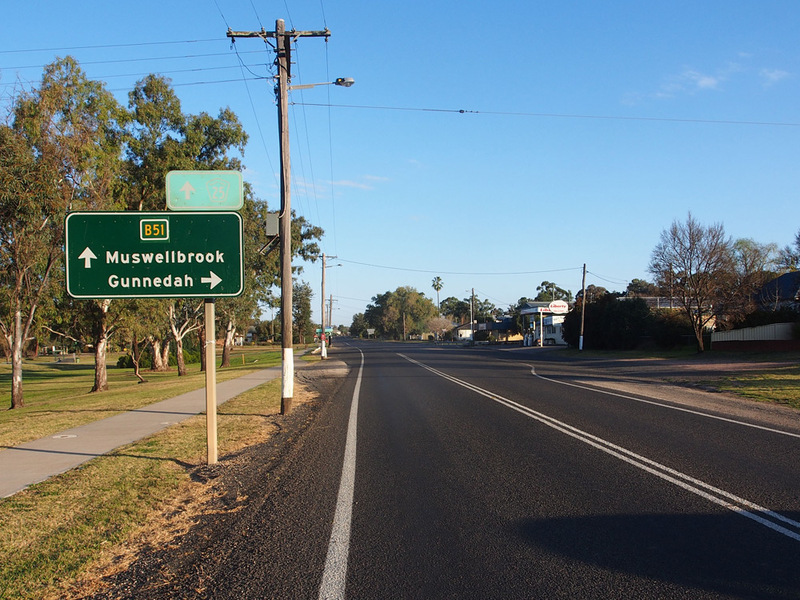 Lovely old black AD sign eastbound on Coonabarabran Road approaching the junction with Kamilaroi Highway, 11km north of Quirindi. 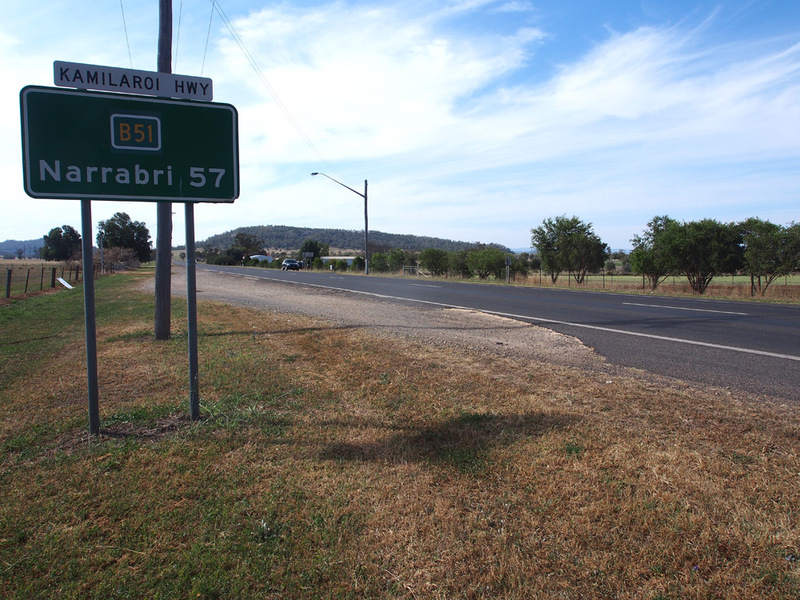 ID sign assembly at the junction of Kamilaroi Highway & Coonabarabran Road, 11km north of Quirindi. 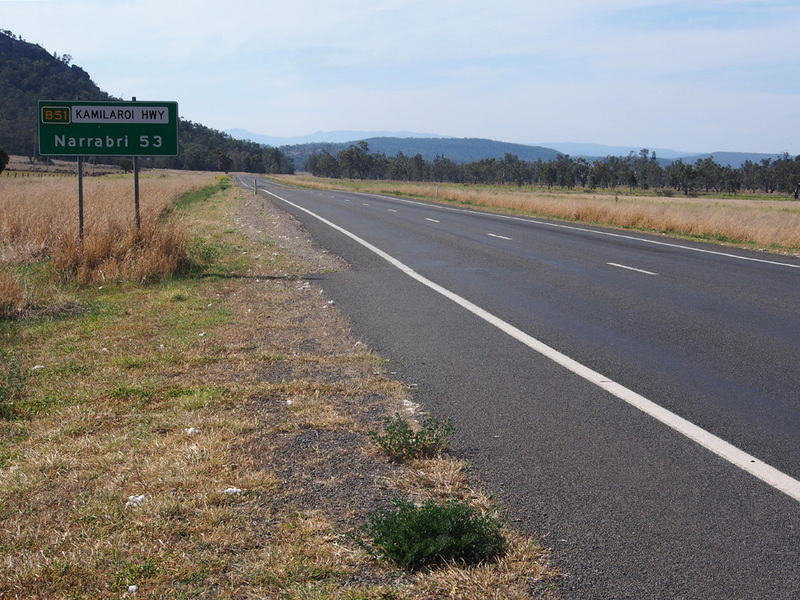 Dodgy AD sign southbound on Kamilaroi Highway approaching the junction with Coonabarabran Road, 11km north of Quirindi. 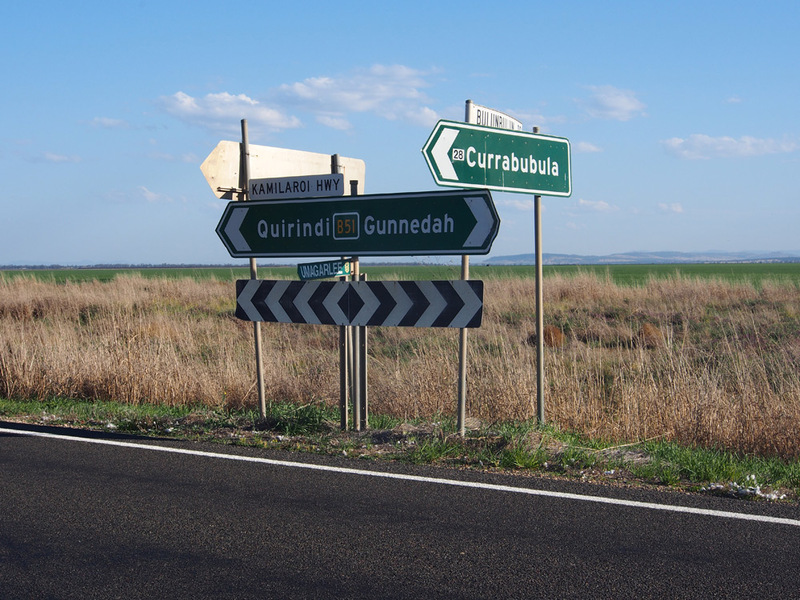 RD sign northbound after the junction with Coonabarabran Road, 11km north of Quirindi. 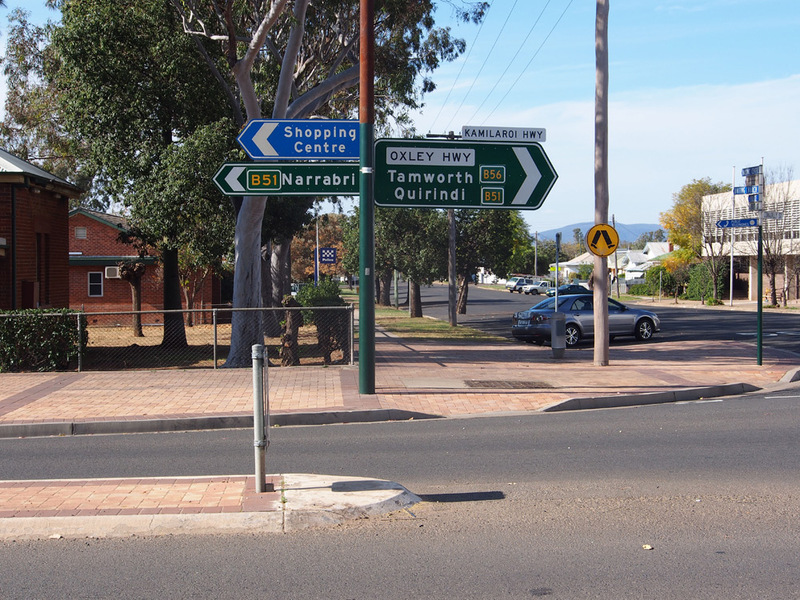 Dodgy fingerboard sign assembly at the junction of Kamilaroi Highway & Taylors Lane, 14km north of Quirindi. At least this time the route number is finally included. 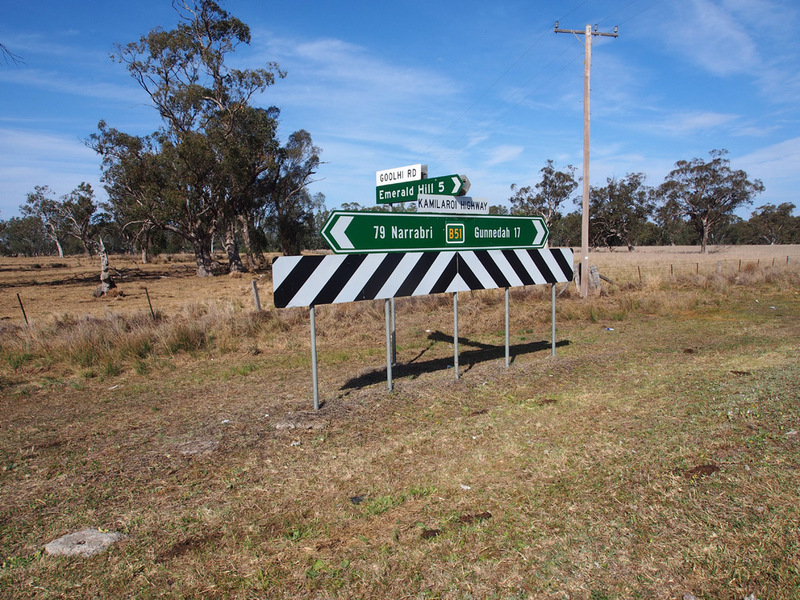 Much better fingerboard sign assembly at the junction of Kamilaroi Highway & Slack Smiths Lane, 17km north of Quirindi. 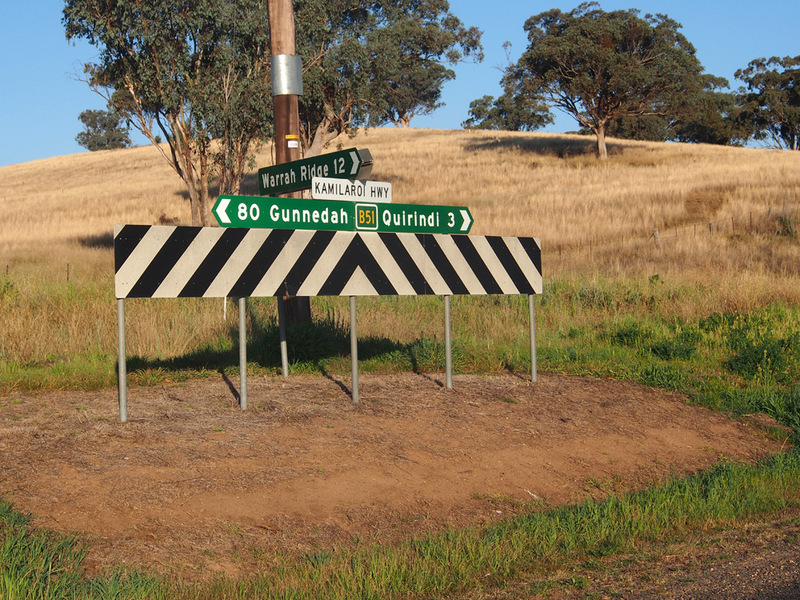 RD sign pre-dating the declaration of Kamilaroi Highway, southbound after the junctions with Gap Road & Waverly Road, 26km north of Quirindi. 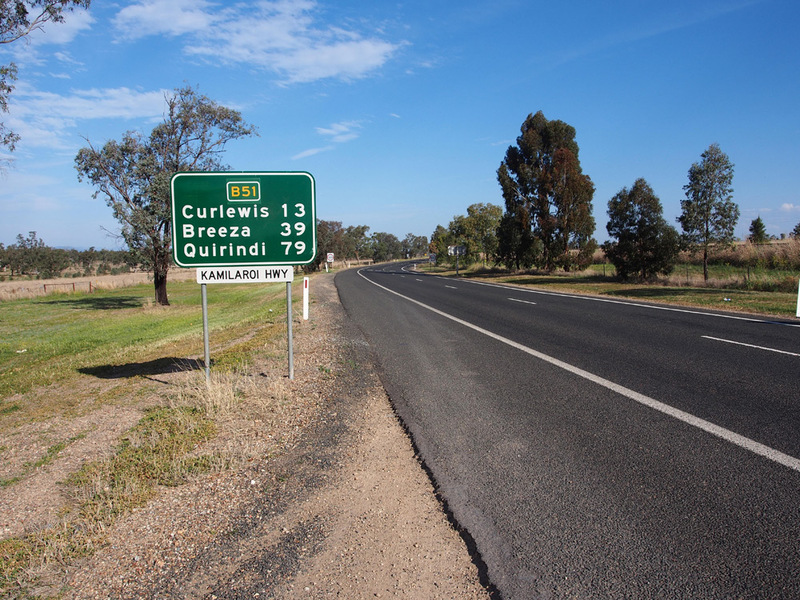 AD sign northbound on Kamilaroi Highway approaching the junctions with Gap Road & Waverly Road, 26km north of Quirindi. 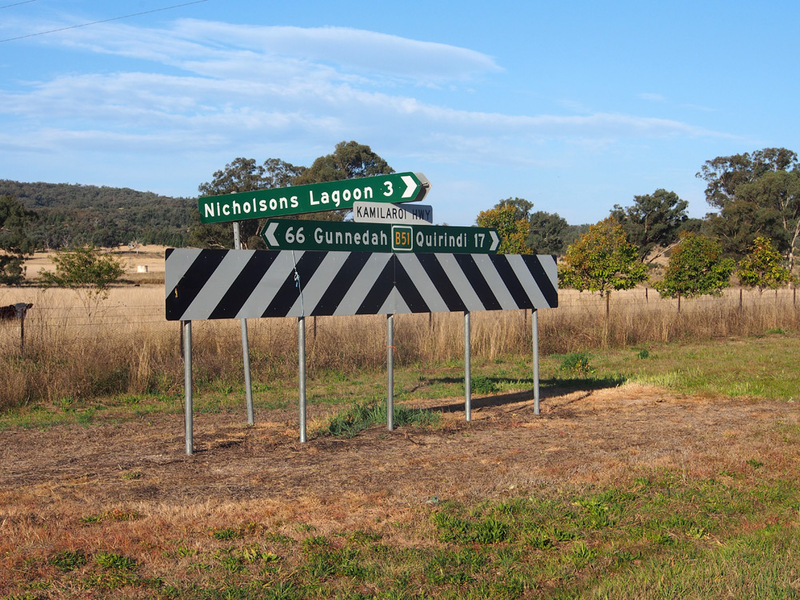 AD sign westbound on Gap Road approaching the junction with Kamilaroi Highway, 26km north of Quirindi. 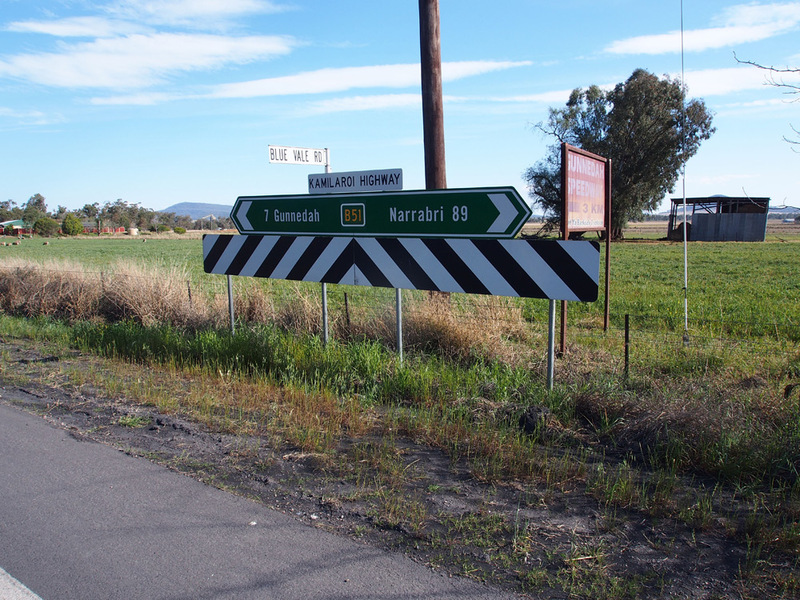 ID sign assembly at the junction of Kamilaroi Highway & Gap Road, 26km north of Quirindi. 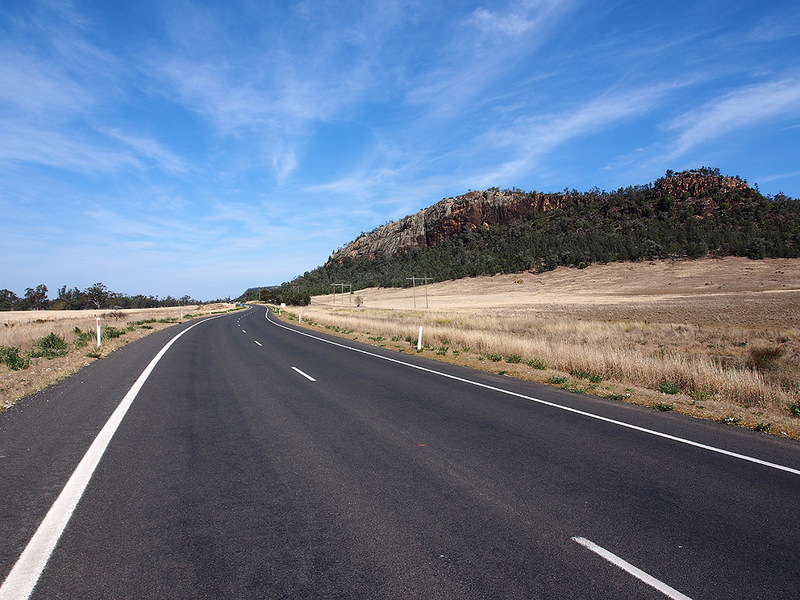 Kamilaroi Highway looking south from Waverly Road towards the junction with Gap Road, 26km north of Quirindi. 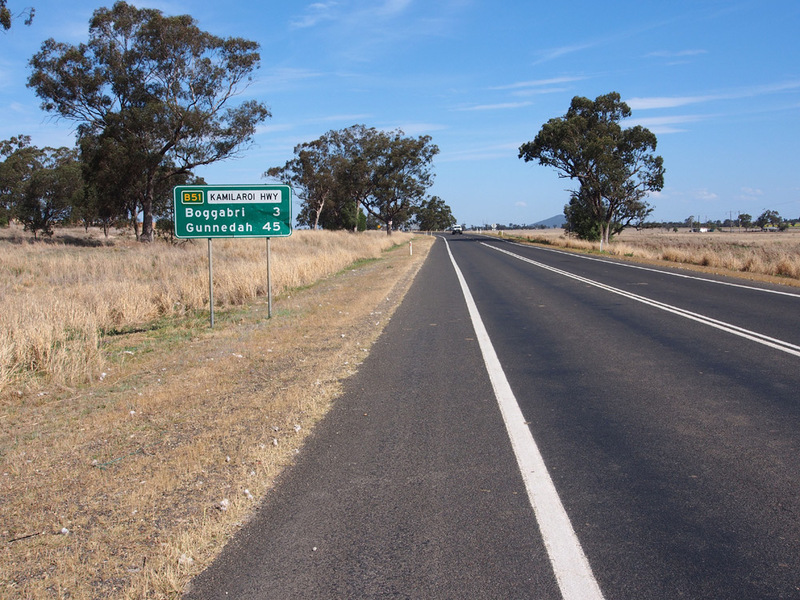 AD sign eastbound on Waverly Road approaching the junction with Kamilaroi Highway, 26km north of Quirindi. 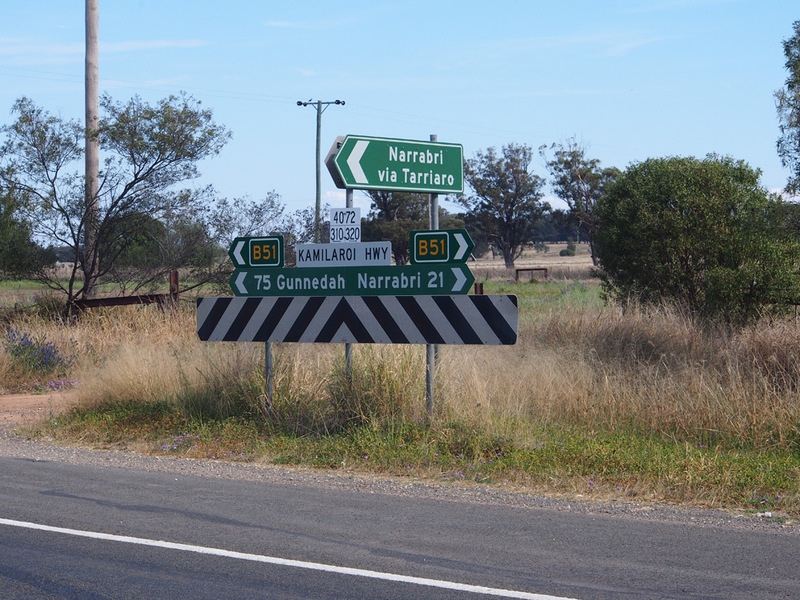 Dodgy ID/fingerboard sign assembly at the junction of Kamilaroi Highway & Waverly Road, 26km north of Quirindi. 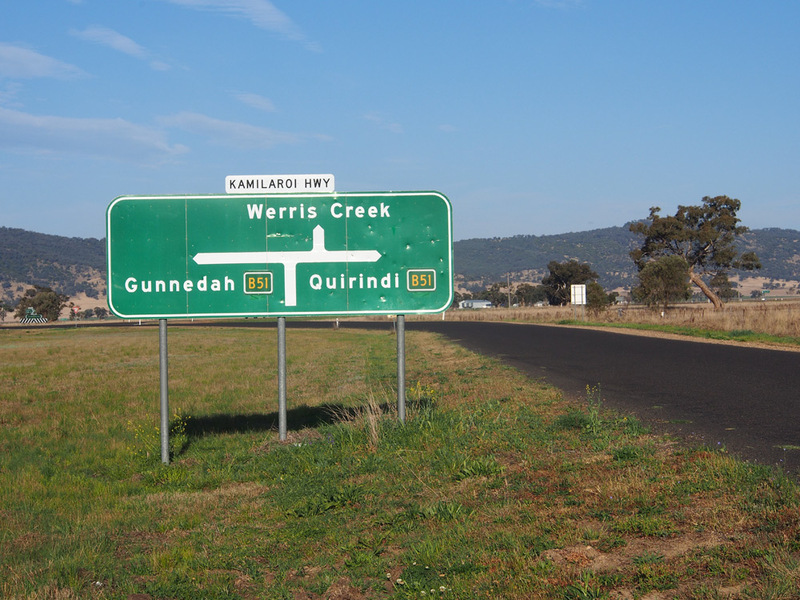 AD sign southbound on Kamilaroi Highway approaching the junctions with Waverly Road & Gap Road, 26km north of Quirindi. 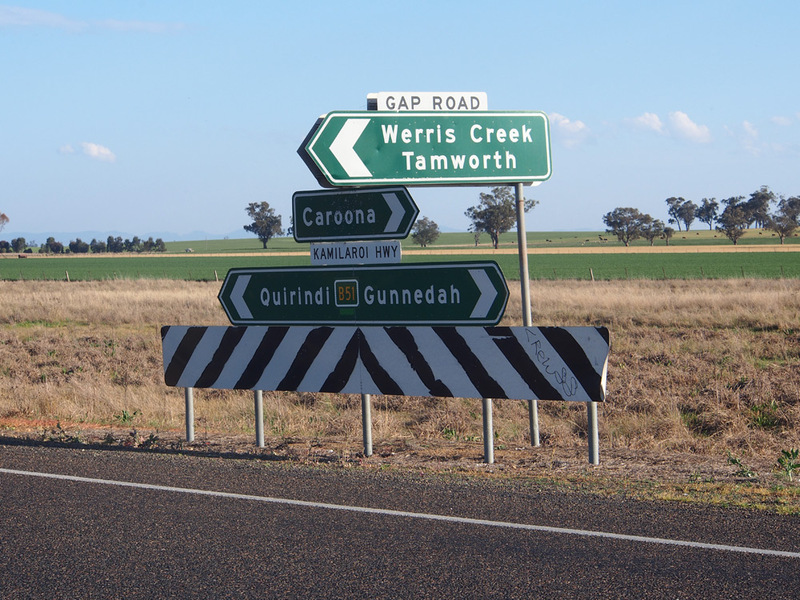 RD sign northbound on Kamilaroi Highway after the junctions with Gap Road & Waverly Road, 26km north of Quirindi. 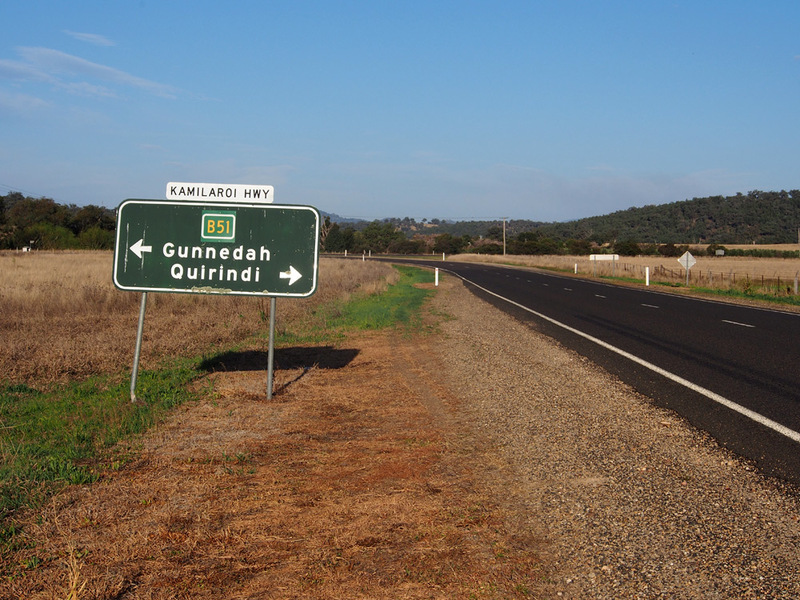 ID sign assembly at the junction of Kamilaroi Highway & Mystery Road, 37km north of Quirindi/3km south of Breeza. Note the dodgy distance plate which reads "16". 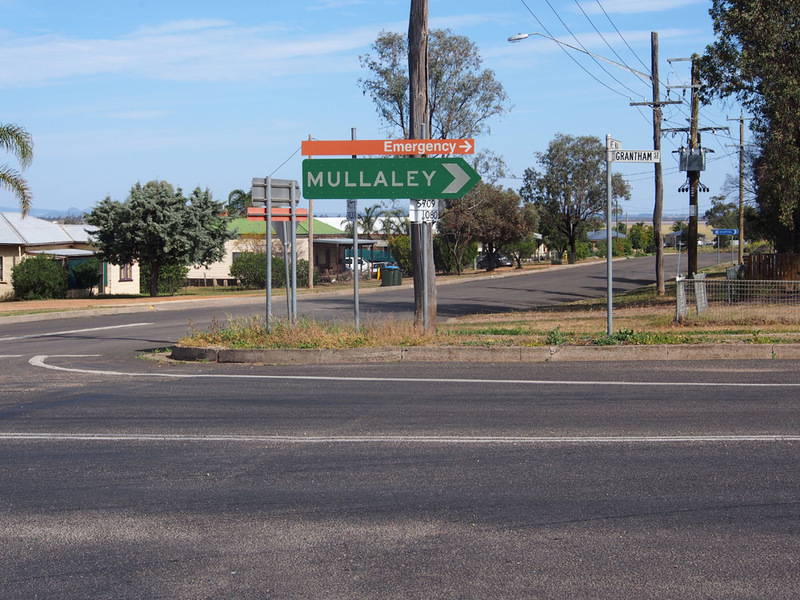 Another dodgy ID sign assembly, this time at the junction of Kamilaroi Highway & Bulunbillun Road, on the southern outskirts of Breeza. 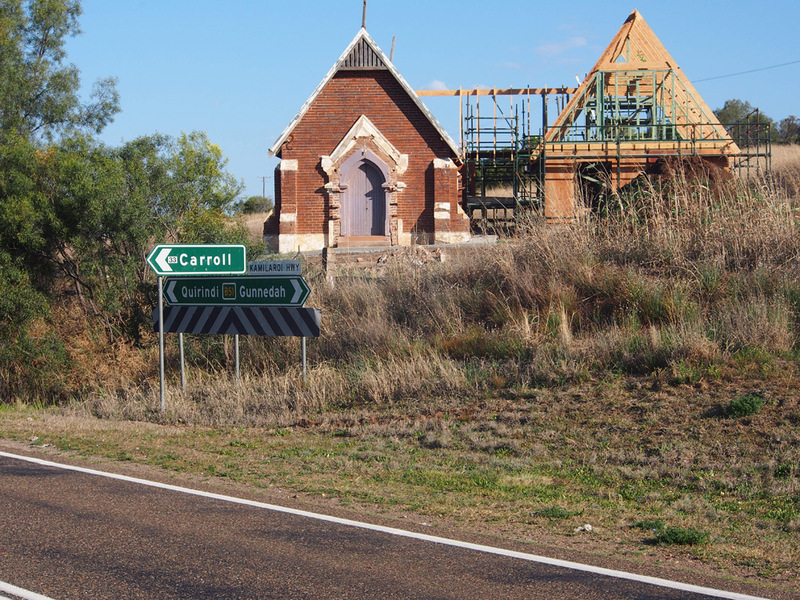 Another dodgy ID sign assembly at the junction of Kamilaroi Highway/Hogarth Street, with the backdrop of St Mary's Church, Breeza. Old and faded tourist ID sign on Kamilaroi Highway on the northern outskirts of Breeza. 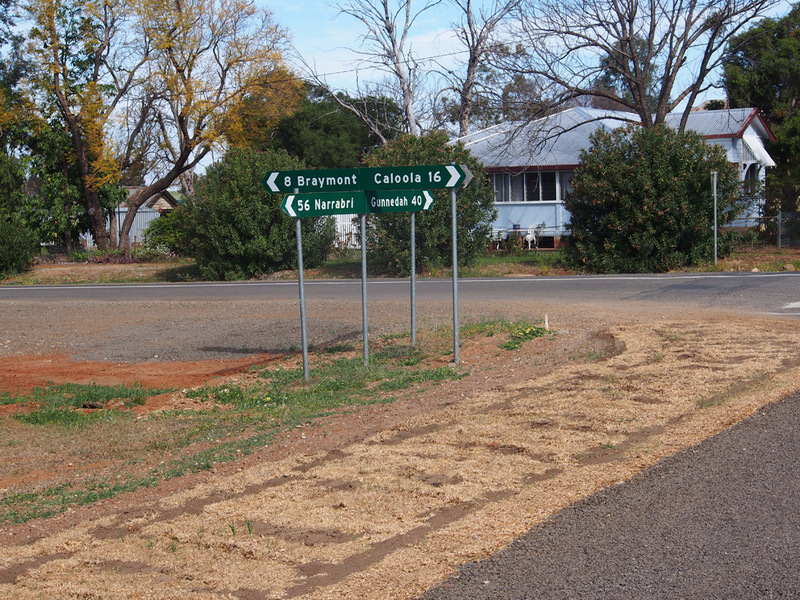 The tourist sign points to 'Ben Hall's Wall'; a memorial to bushranger Ben Hall. 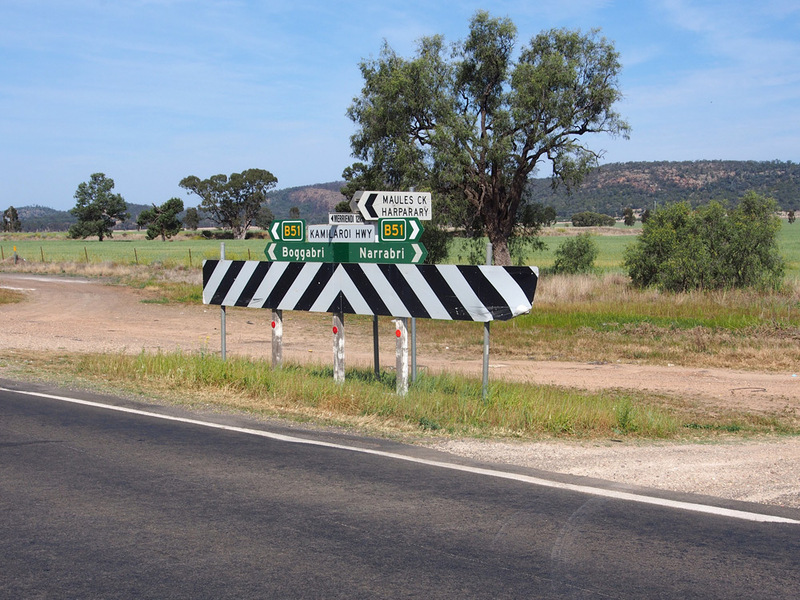 Dodgy fingerboard sign assembly at the junction of Kamilaroi Highway & The Dip Road, 3km north of Breeza. 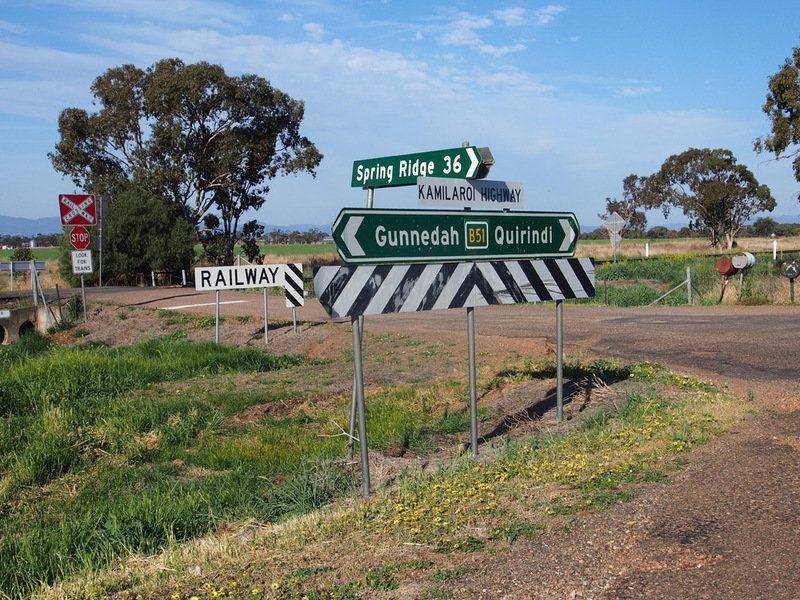 Fingerboard and ID signs at the junction of Kamilaroi Highway & Nea Siding-Spring Ridge Road, Nea. 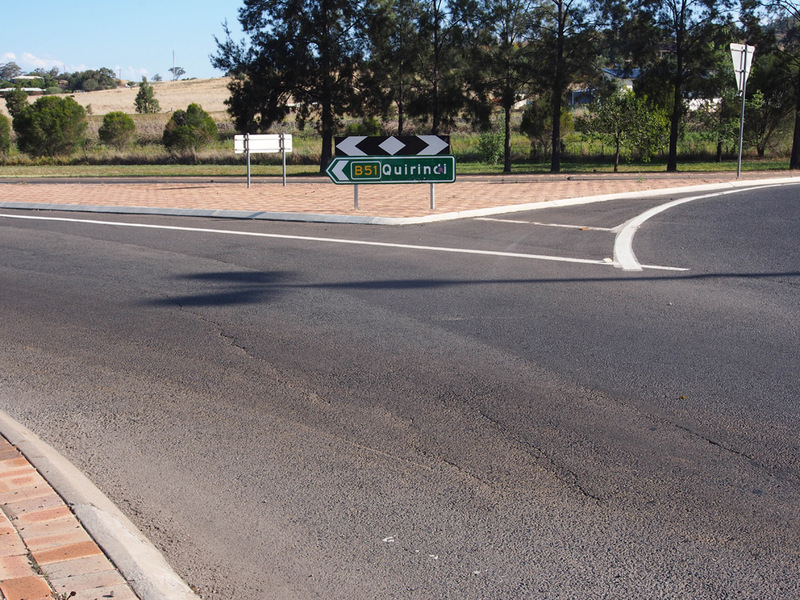 Fingerboard sign assembly at the junction of Kamilaroi Highway & Old Cemetery Road, Curlewis. 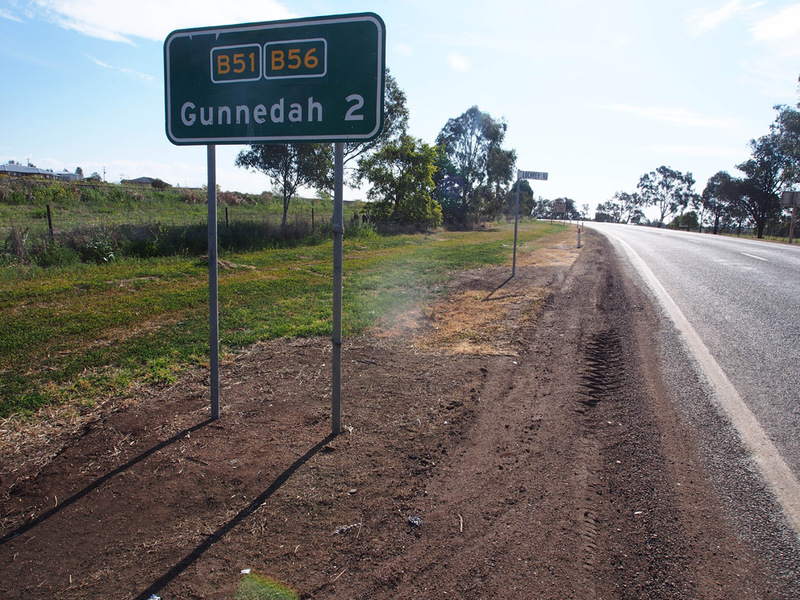 Dodgy RD sign southbound on Kamilaroi Highway after the junction with Oxley Highway, 2km southeast of Gunnedah. 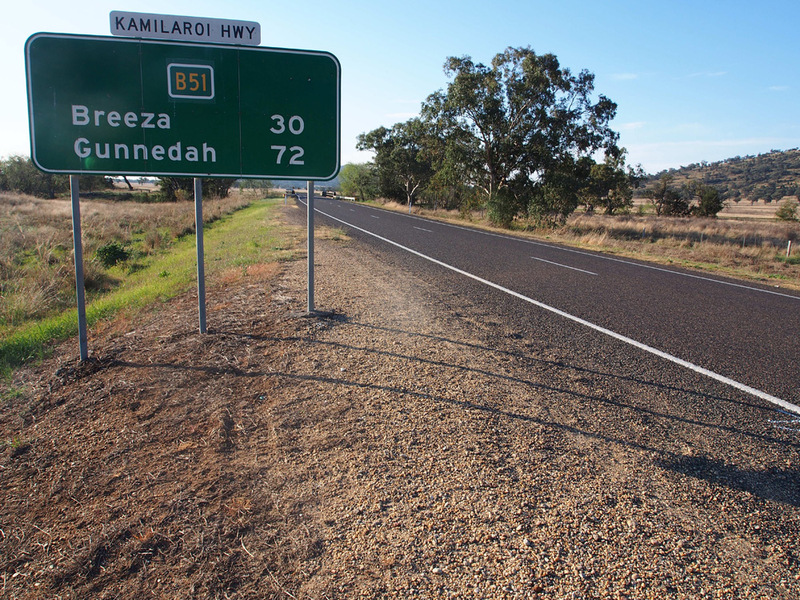 This is a dodgy replacement of a sign installed prior to the declaration of the Kamilaroi Highway. 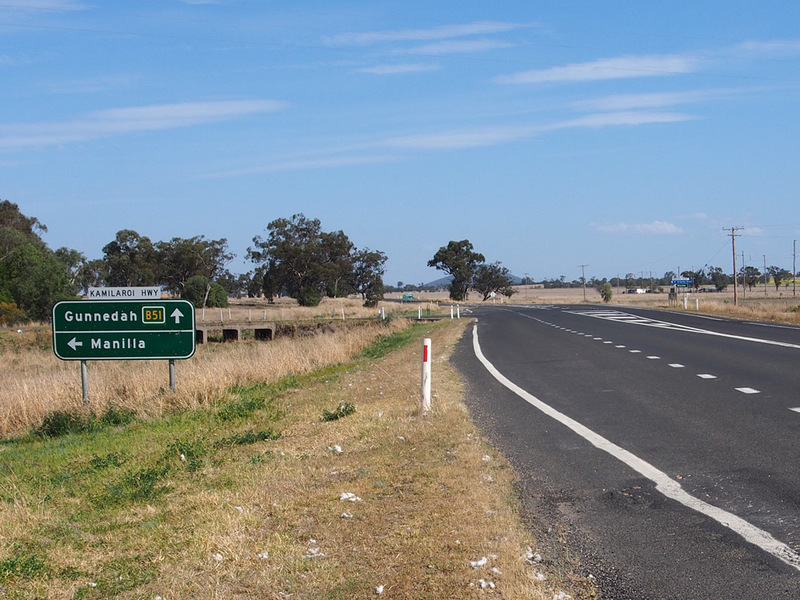 AD sign northbound on Kamilaroi Highway approaching the junction with Oxley Highway, 2km southeast of Gunnedah. 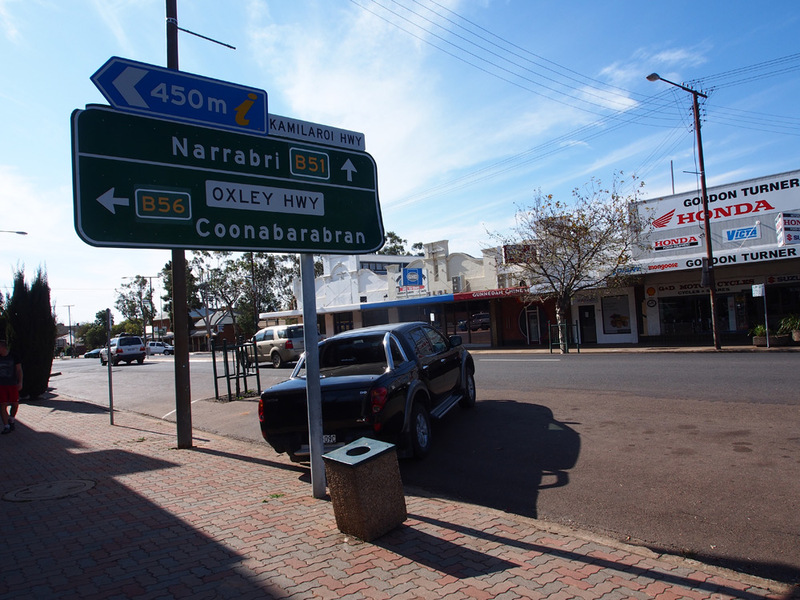 The Kamilaroi Highway has a break in it from this intersection for 2km into Gunnedah where the Oxley Highway takes precedence. 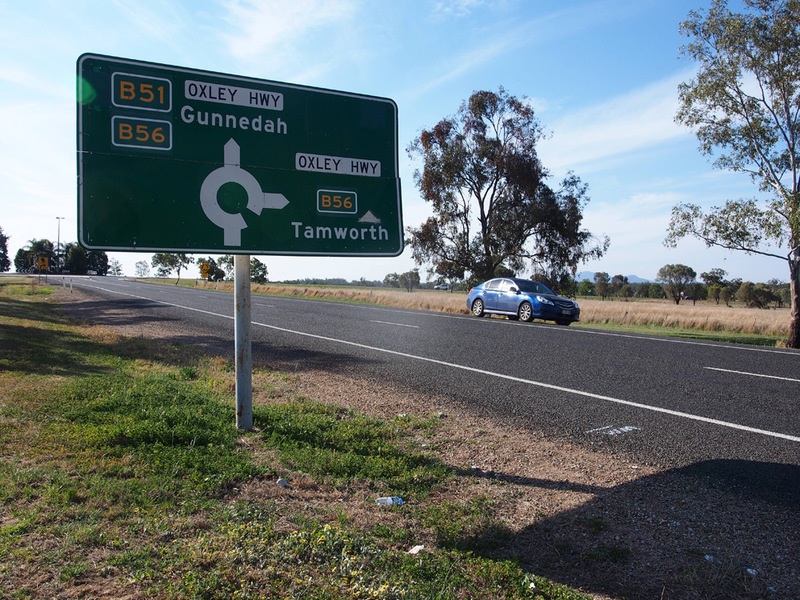 AD sign westbound on Oxley Highway approaching the junction with Kamilaroi Highway, 2km southeast of Gunnedah. 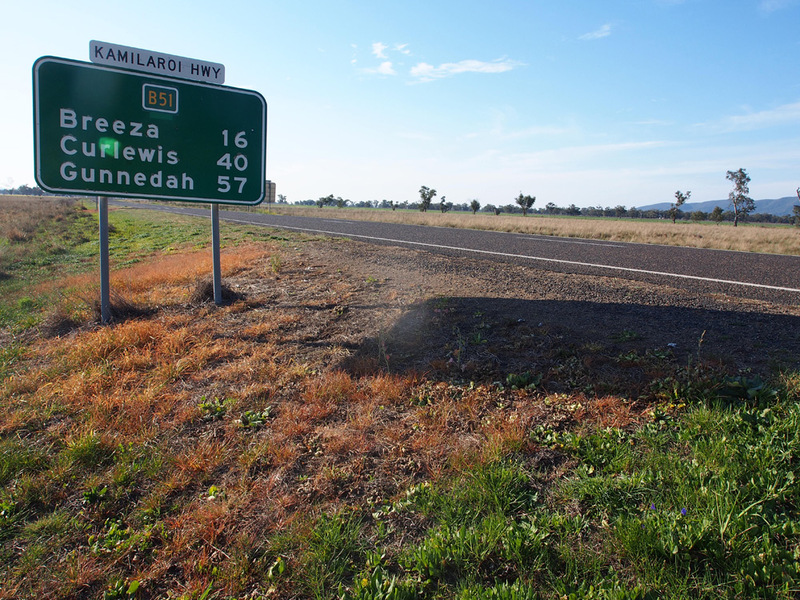 Dodgy low-mounted ID signage at the junction of Oxley & Kamilaroi Highways, 2km southeast of Gunnedah. 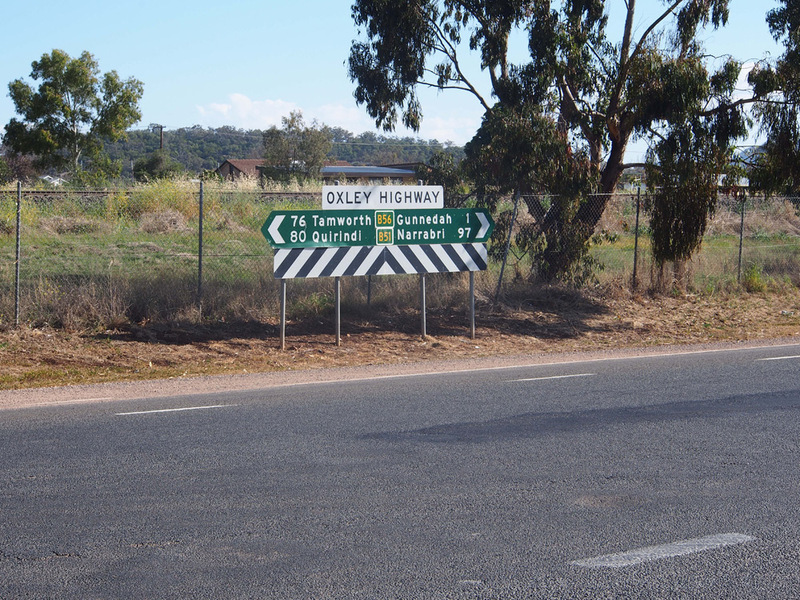 AD sign eastbound on Oxley Highway approaching the junction with Kamilaroi Highway, 2km southeast of Gunnedah. 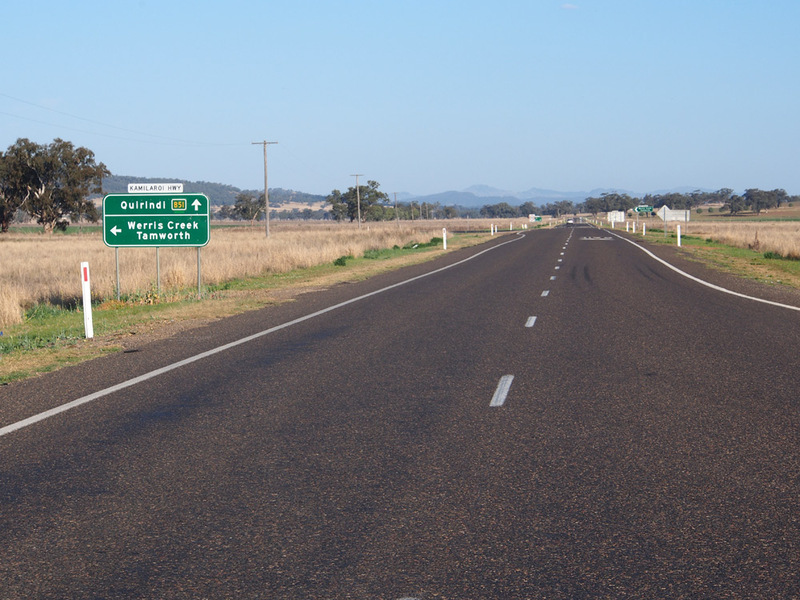 RD sign northbound on Oxley Highway after the junction with Kamilaroi Highway, 2km southeast of Gunnedah. 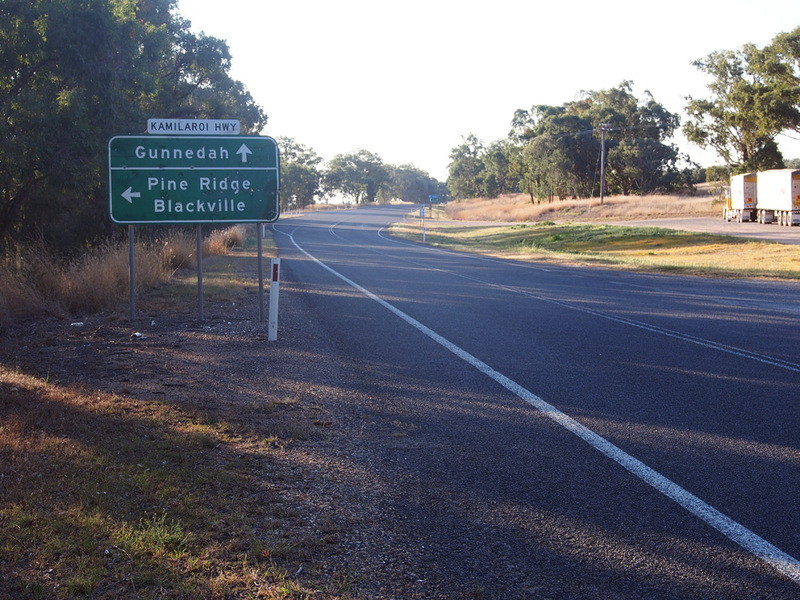 Old black RD sign northbound on Kamilaroi Highway near Stockman Close, on the northern outskirts of Gunnedah. 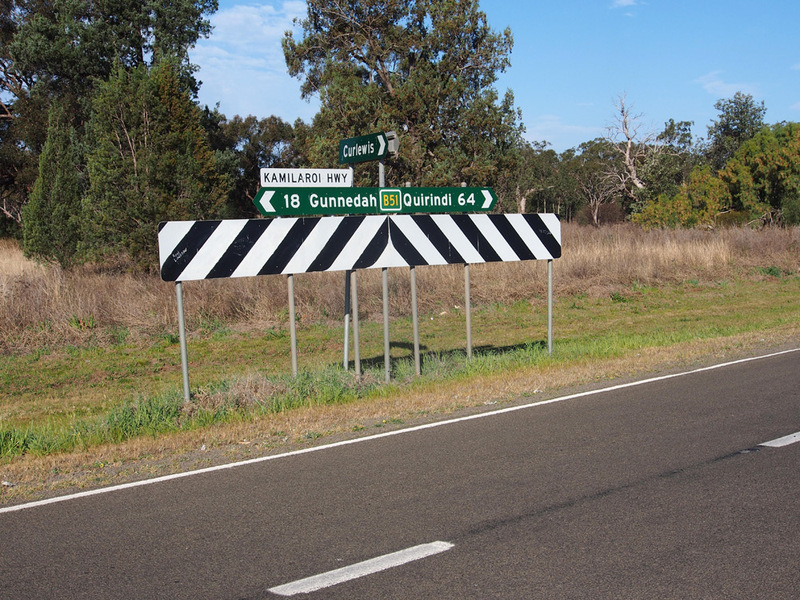 Dodgy fingerboard sign assembly at the junction of Kamilaroi Highway & Quia Road, 3km north of Gunnedah. 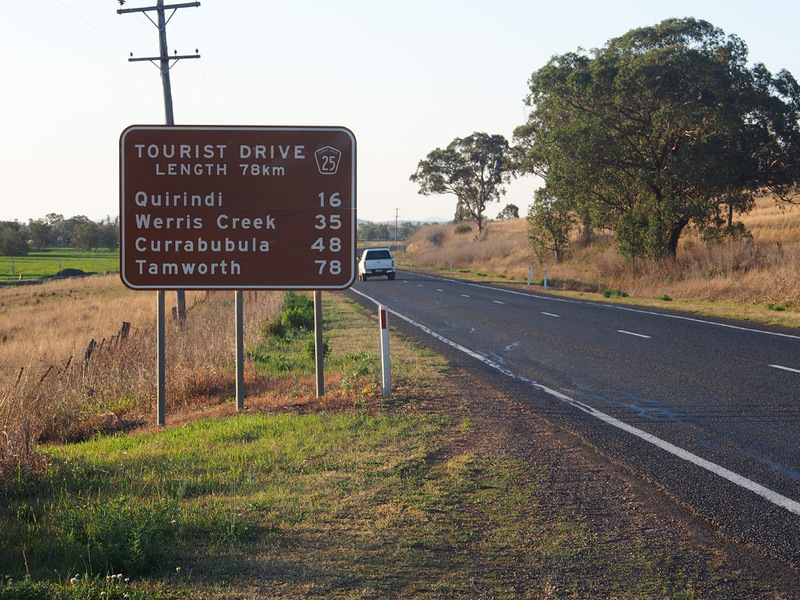 Dodgy fingerboard sign at the junction of Kamilaroi Highway & Blue Vale Road, 7km north of Gunnedah. 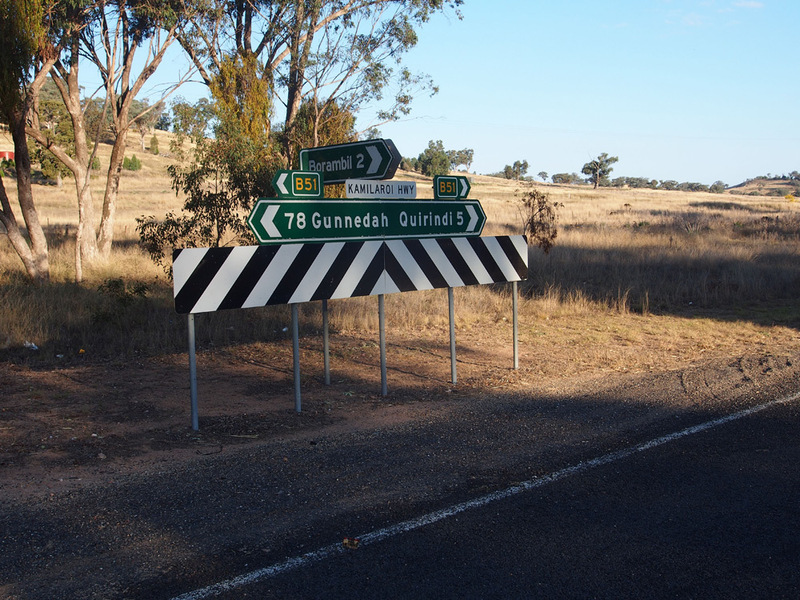 Dodgy fingerboard sign assembly at the junction of Kamilaroi Highway & Goolhi Road, 17km north of Gunnedah. 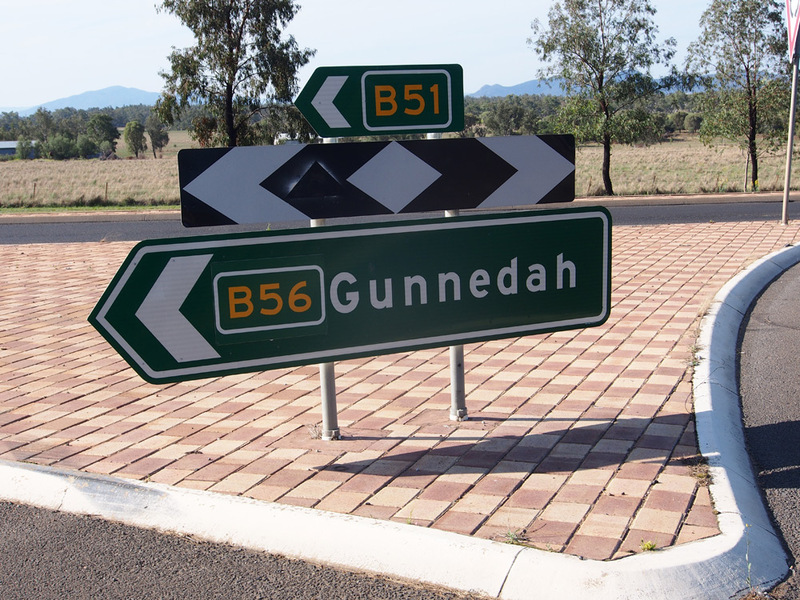 Dodgy fingerboard sign at the junction of Kamilaroi Highway & Binnalong Road, 36km north of Gunnedah/3km south of Boggabri. 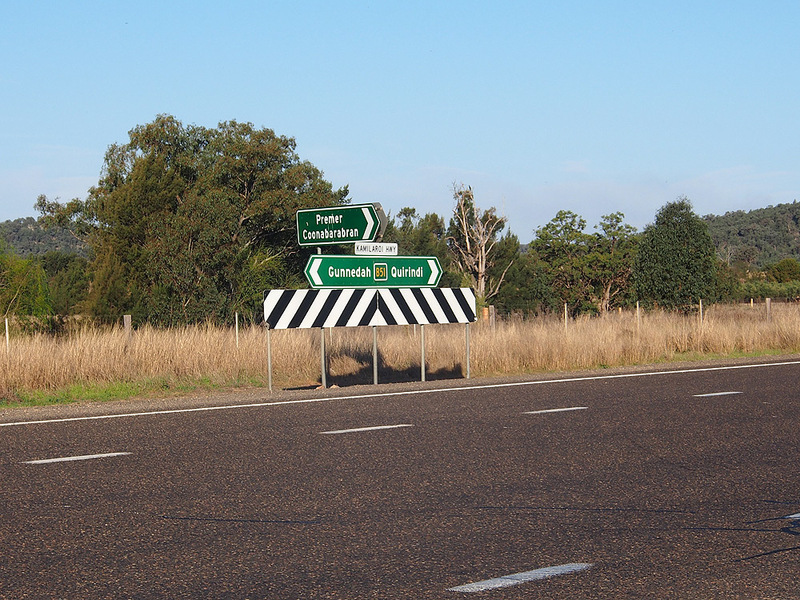 RD sign southbound on Kamilaroi Highway on the southern outskirts of Boggabri. 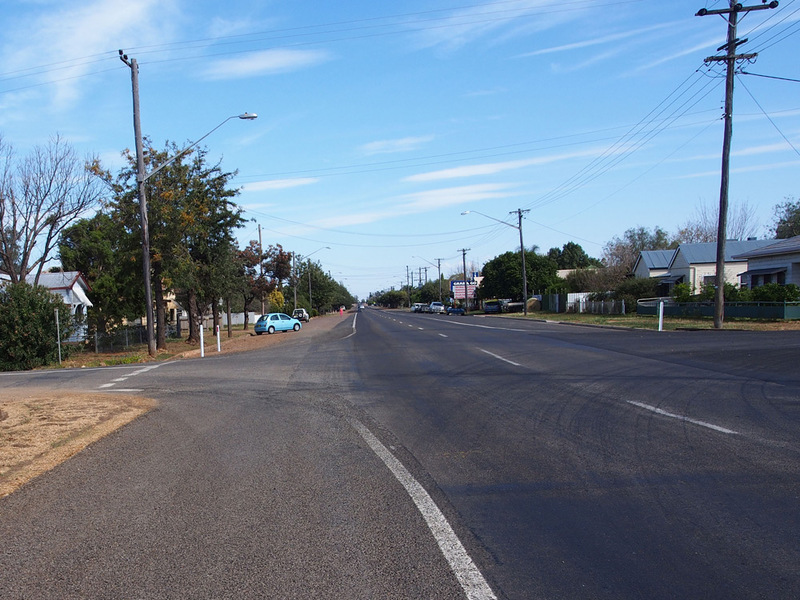 Looking east along Kamilaroi Highway (Grantham Street) at the junction with Merton Street, Boggabri. 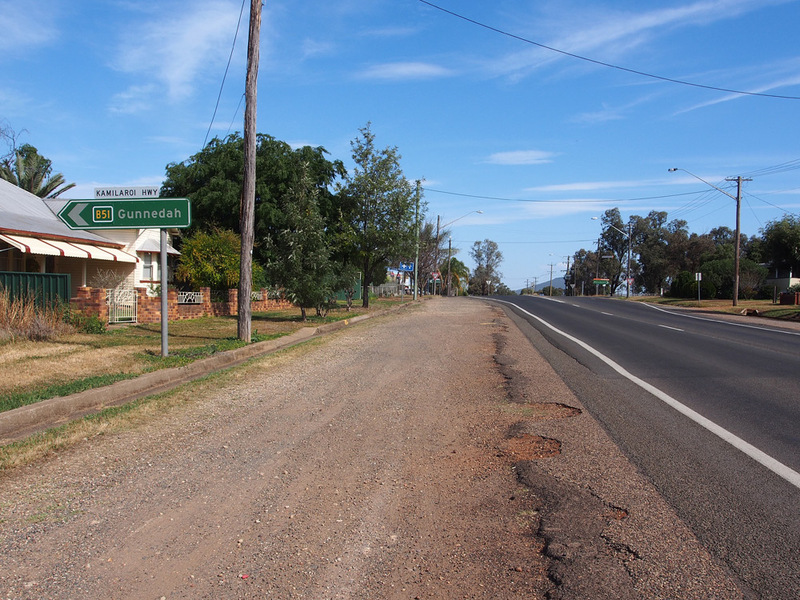 ID sign, acting as an AD sign, on Kamilaroi Highway (Grantham Street) approaching the turn into Wee Waa Street, Boggabri. 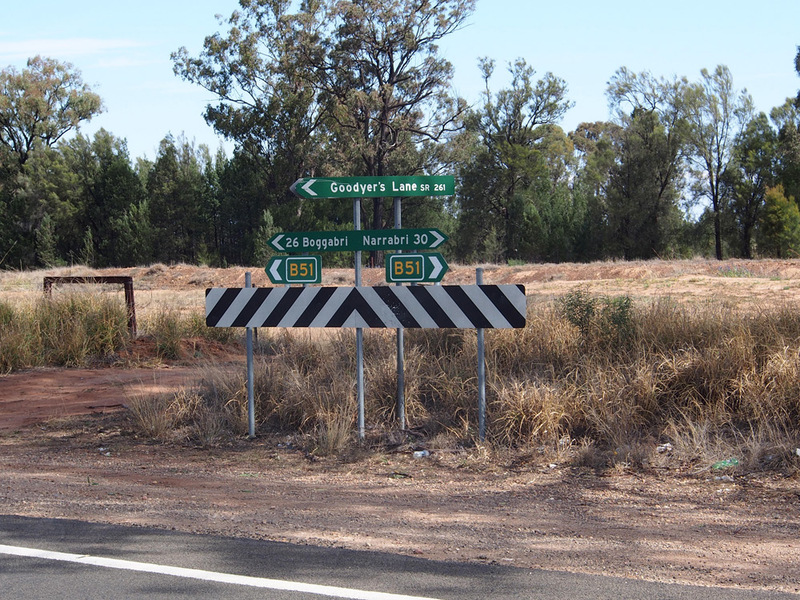 ID signs at the junction of Grantham & Wee Waa Streets, Boggabri. 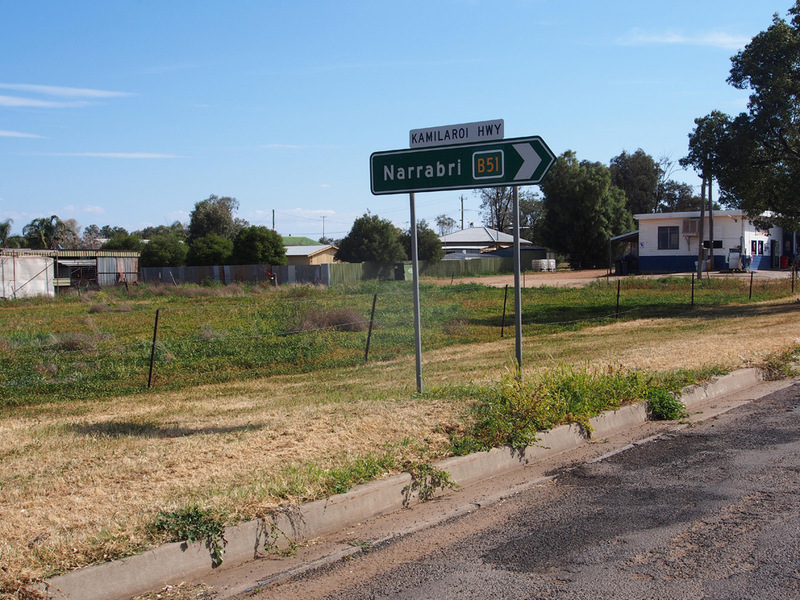 ID sign, acting as an AD sign, on Kamilaroi Highway (Wee Waa Street) approaching the turn into Grantham Street, Boggabri. 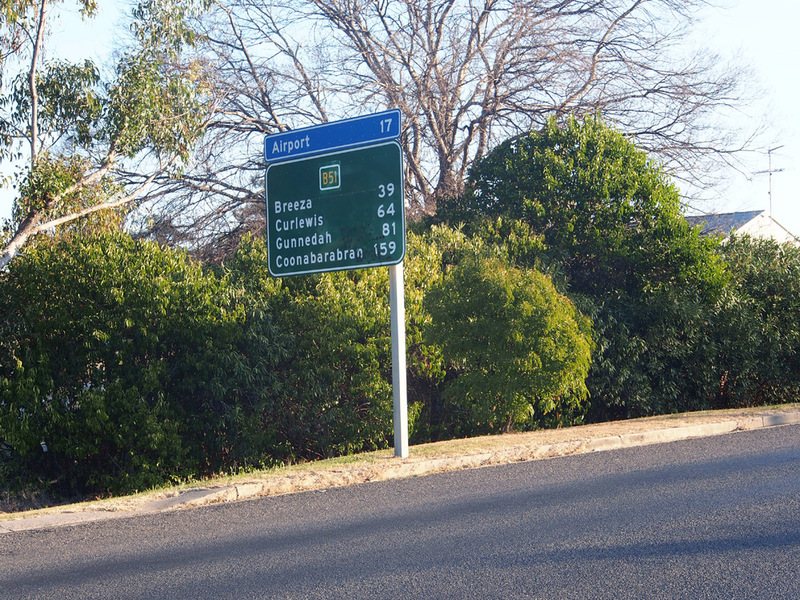 Fingerboard sign assembly missing a B51 route marker at the junction of Kamilaroi Highway (Wee Waa Street) & Braymont Road/Boston Street, Boggabri. 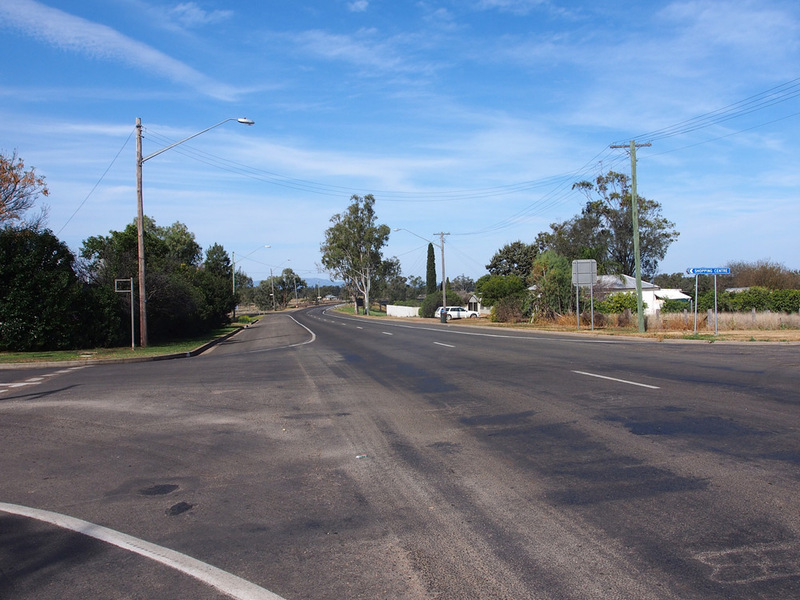 Kamilaroi Highway (Wee Waa Street) looking south at Braymont Road/Boston Street, Boggabri. 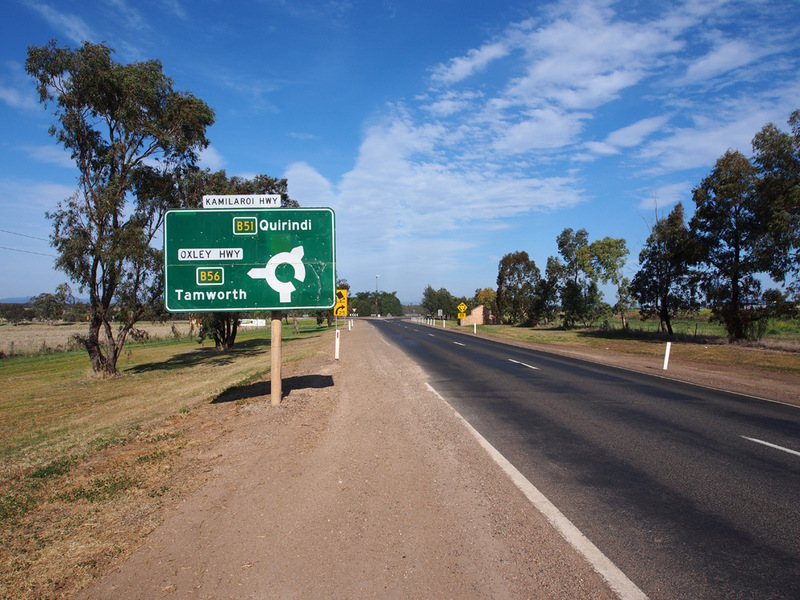 RD sign northbound on Kamilaroi Highway on the northern outskirts of Boggabri. 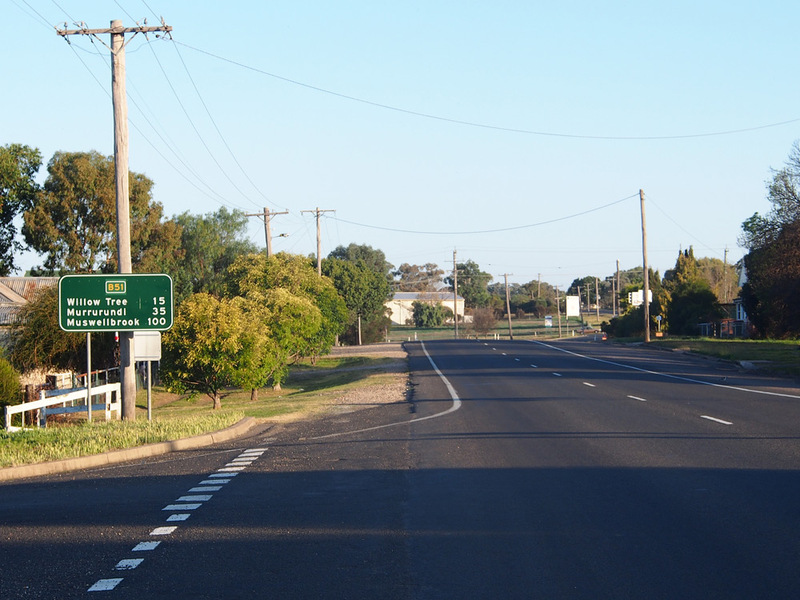 RD sign southbound on Kamilaroi Highway after the junction with Rangari Road, 3km north of Boggabri. 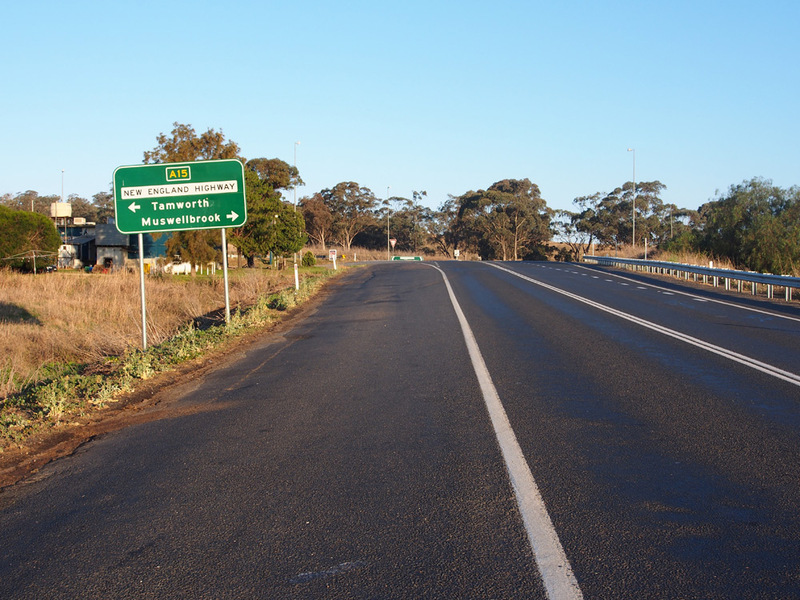 AD sign with topknot, northbound on Kamilaroi Highway approaching the junction with Rangari Road, 3km north of Boggabri. 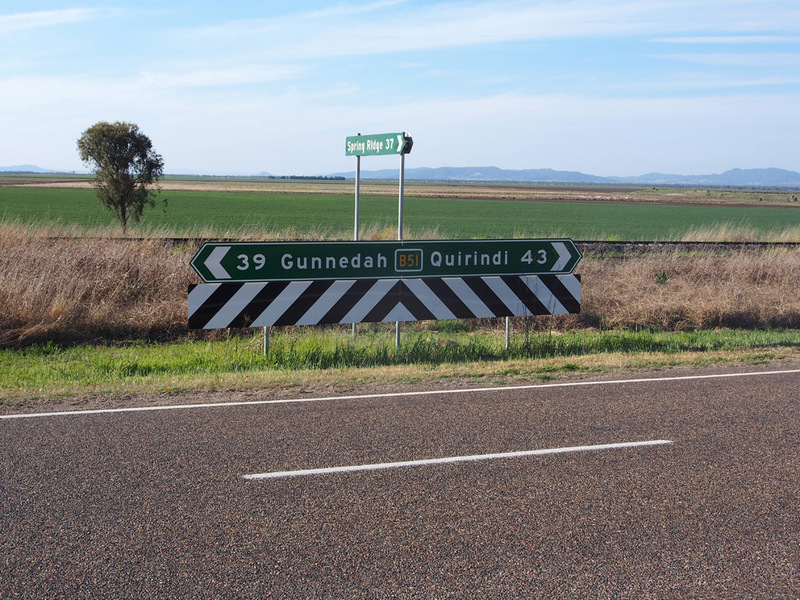 Dodgy ID sign assembly at the junction of the Kamilaroi Highway & Rangari Road, 3km north of Boggabri. 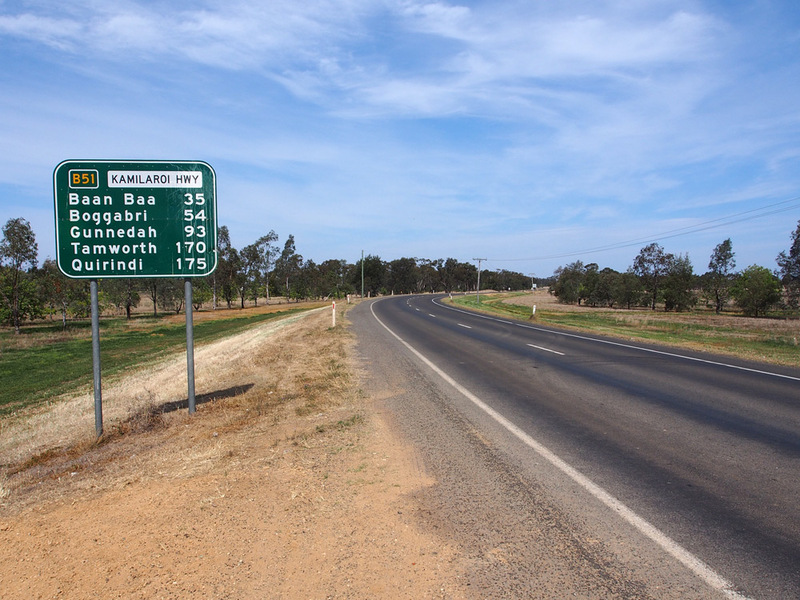 AD sign southbound on Kamilaroi Highway approaching the junction with Rangari Road, 3km north of Boggabri. 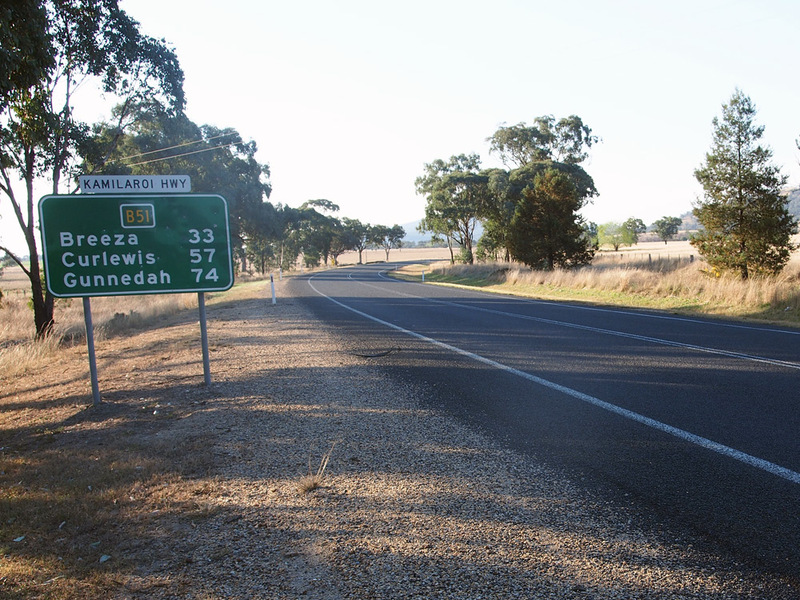 RD sign northbound on Kamilaroi Highway after the junction with Rangari Road, 3km north of Boggabri. 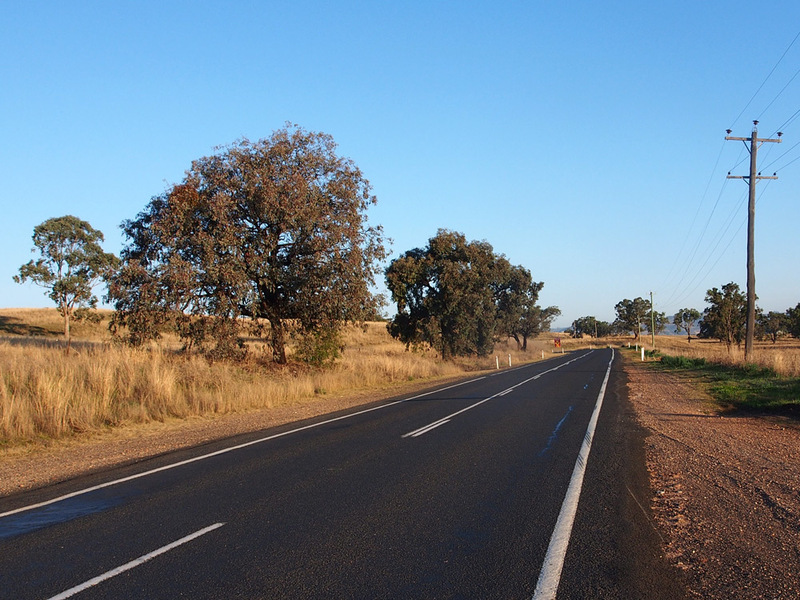 Kamilaroi Highway looking south approximately 6km north of Boggabri. 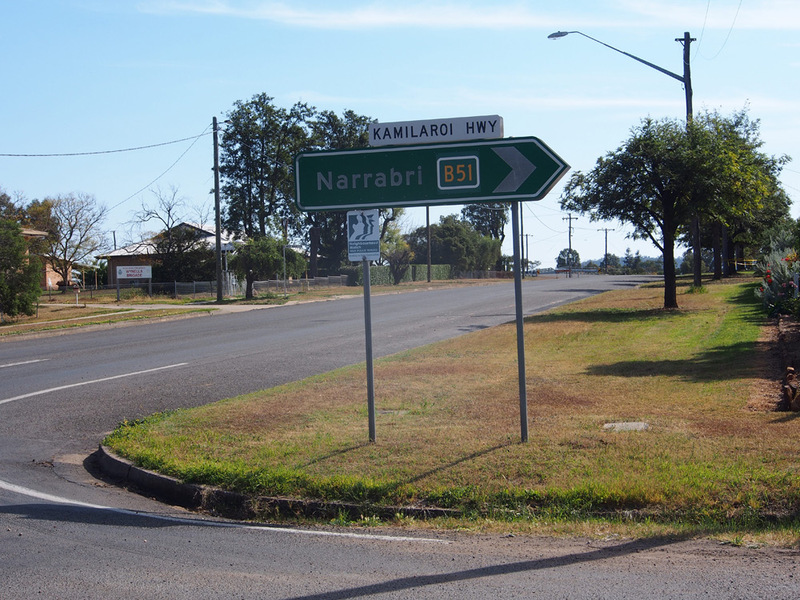 Dodgy fingerboard sign assembly at the junction of Kamilaroi Highway & an unnamed road (old alignment of Harparary Road? 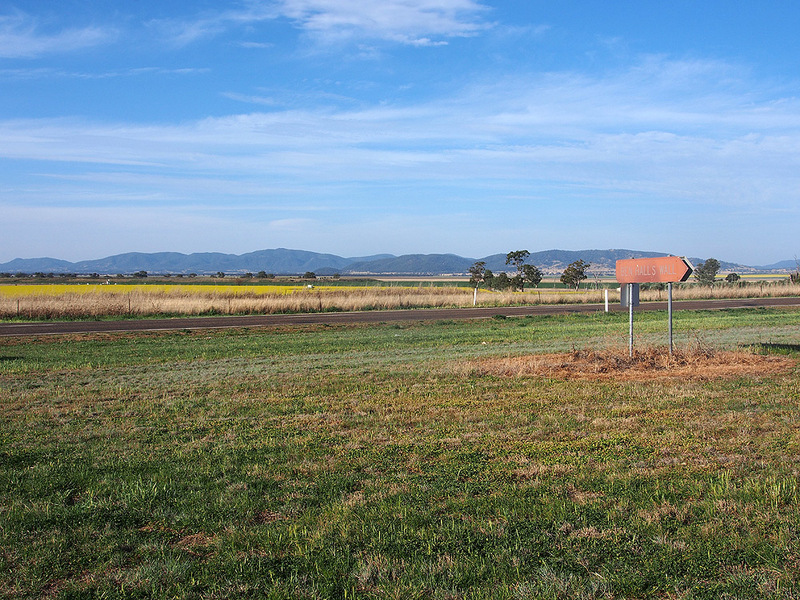 ), 12km north of Boggabri. 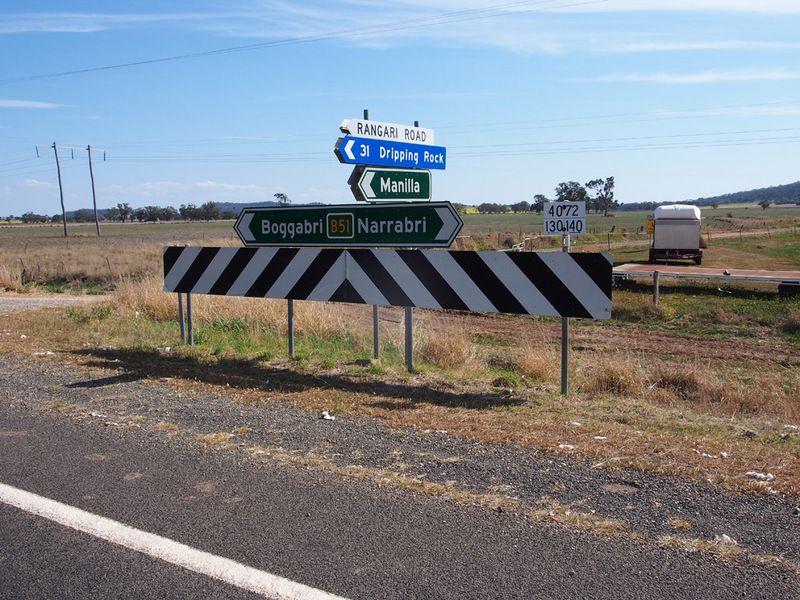 Dodgy fingerboard sign assembly at the junction of Kamilaroi Highway & Harparary Road, 16km north of Boggabri. 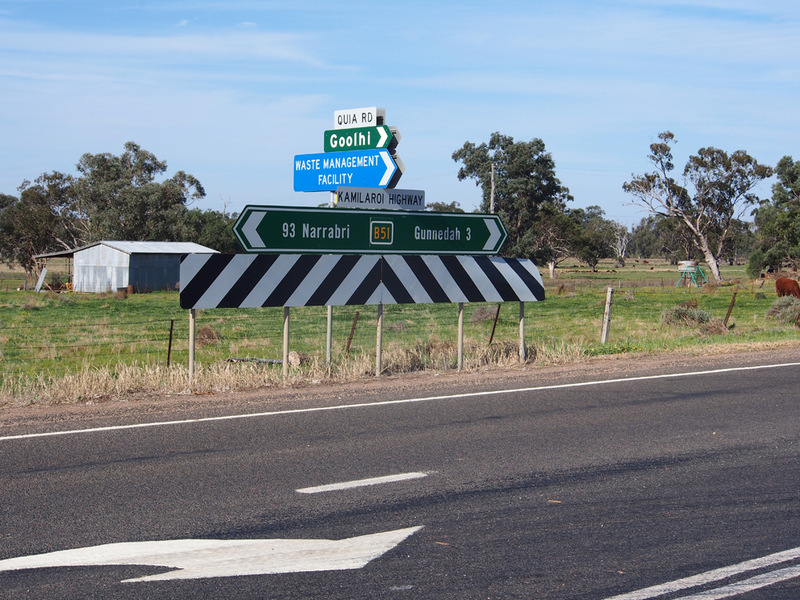 Dodgy fingerboard sign assembly at the junction of Kamilaroi Highway & Mayfield Road, 20km north of Boggabri/2km north of Baan Baa. 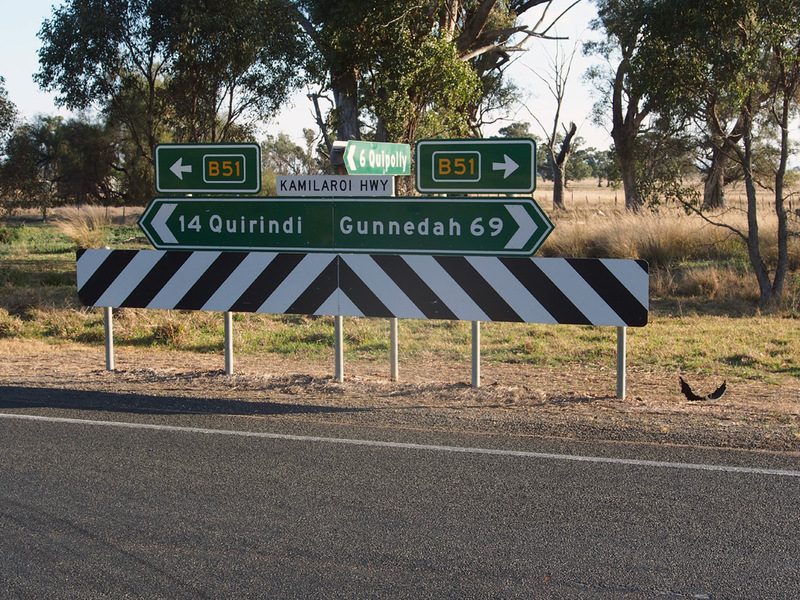 Dodgy fingerboard sign assembly at the junction of Kamilaroi Highway & Goodyers Lane, 26km north of Boggabri. 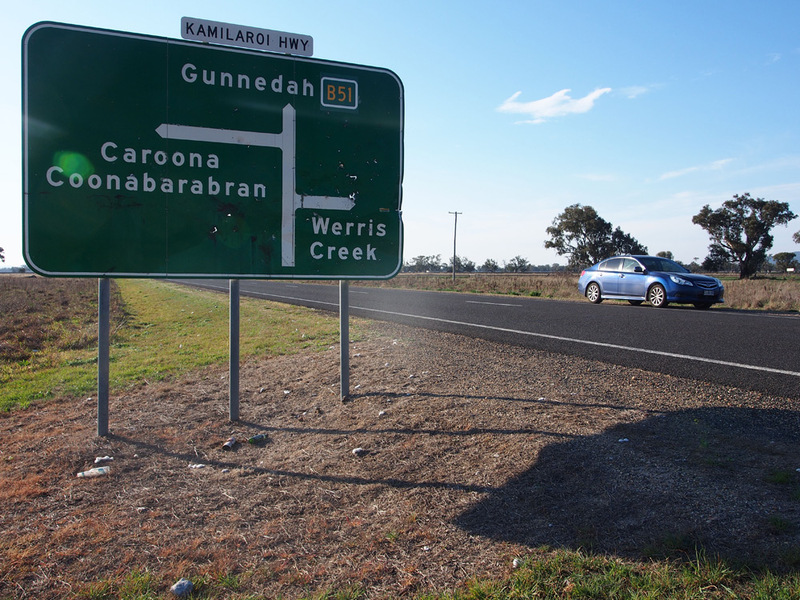 Dodgy fingerboard sign assembly at the junction of Kamilaroi Highway & Kurrajong Creek Road, 28km north of Boggabri. 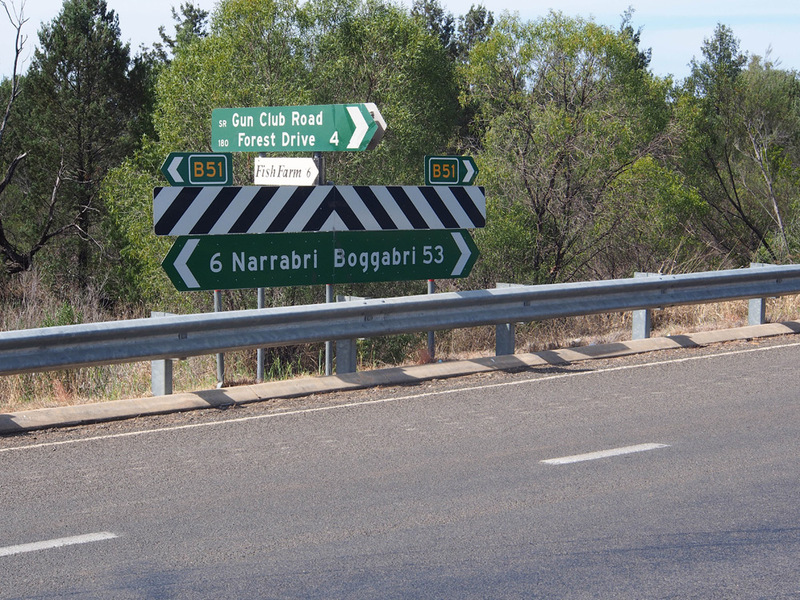 Dodgy fingerboard sign assembly at the junction of Kamilaroi Highway & Turrawan Road, 35km north of Boggabri. Turrawan Road is the former Trunk Road No. 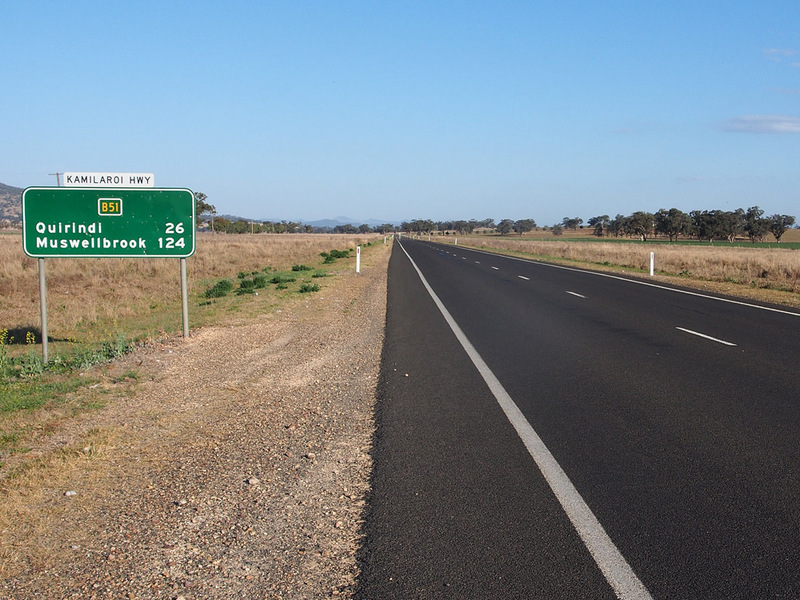 72 (precursor to Kamilaroi Highway) route into Narrabri. 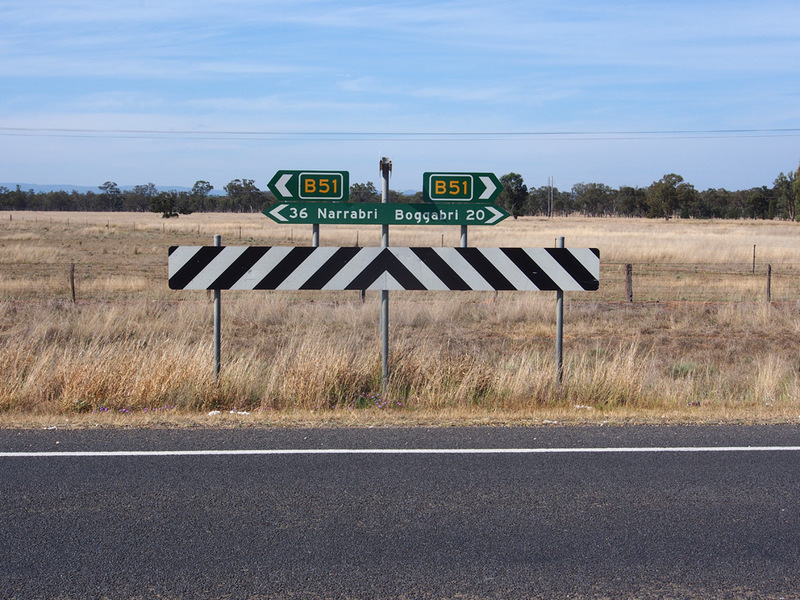 Dodgy fingerboard sign assembly at the junction of Kamilaroi Highway & Gun Club Road, 53km north of Boggabri/6km south of Narrabri. 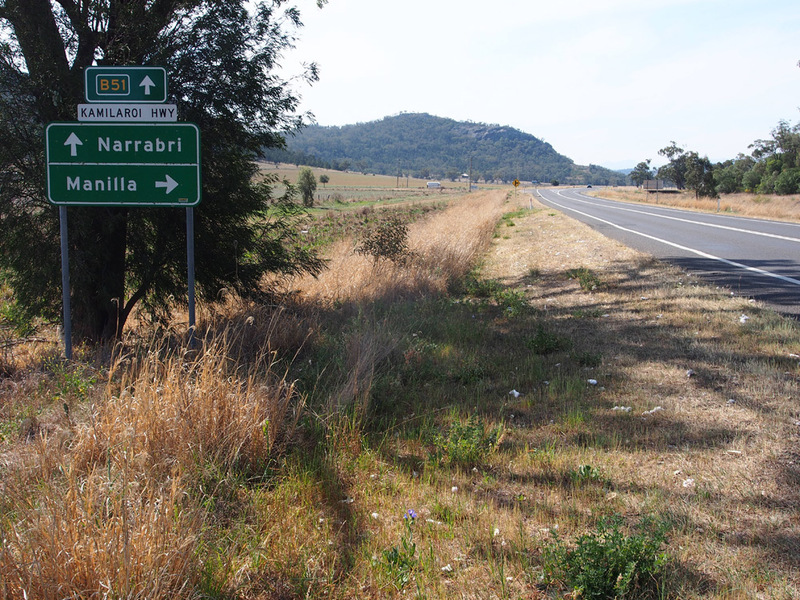 RD sign southbound on Kamilaroi Highway after the junction with Newell Highway at Narrabri West. 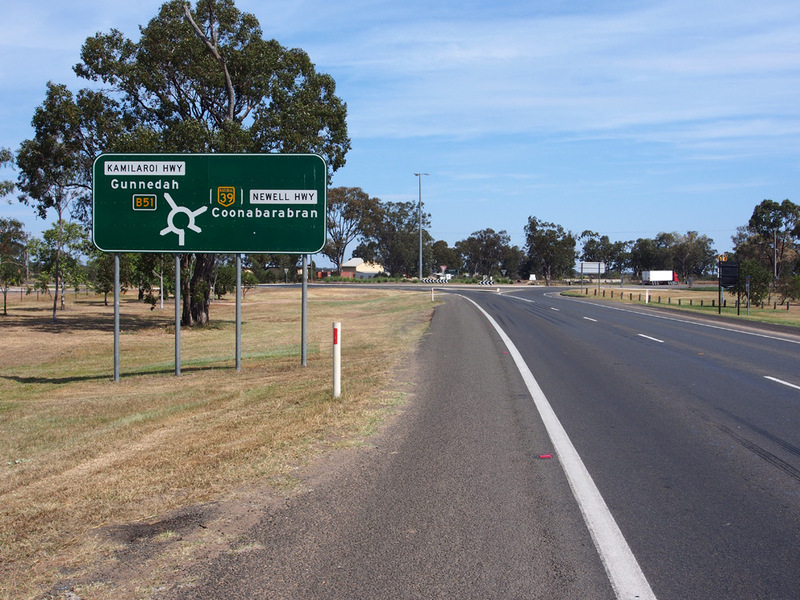 AD sign northbound on Kamilaroi Highway approaching the junction with Newell Highway at Narrabri West. 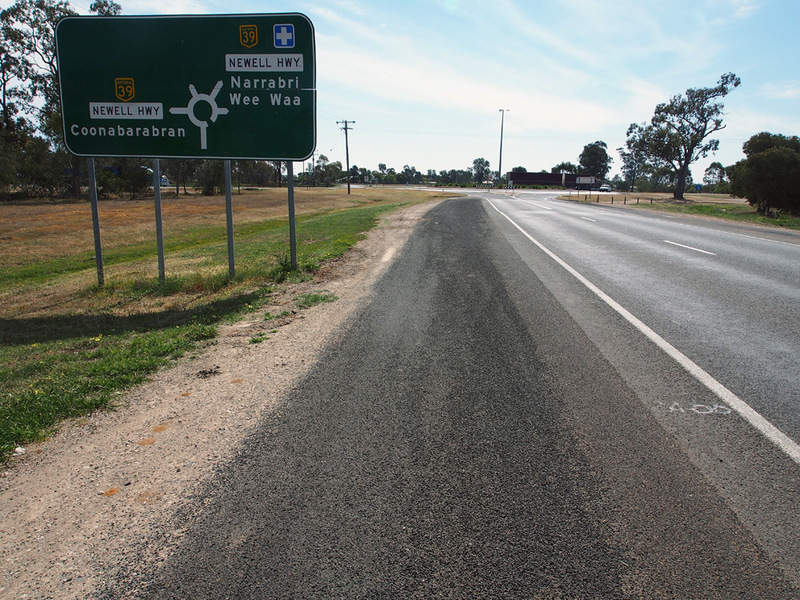 This is the northern terminus of route B51; Kamilaroi Highway has a short break through Narrabri before recommencing and continuing west to Wee Waa and Walgett. At the time this photo was taken, A39 had yet to be uncovered. 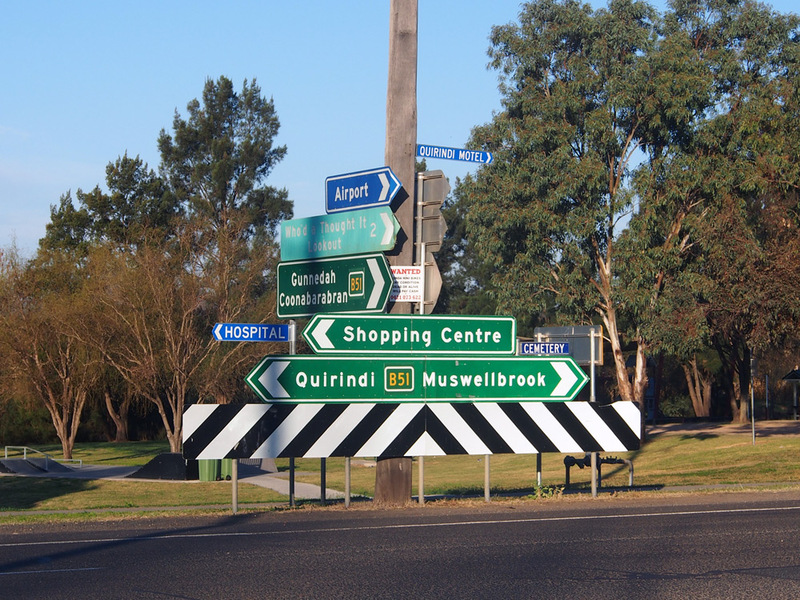 ID signs at the junction of Newell Highway & Kamilaroi Highway, Narrabri West. At the time these photos were taken, A39 had yet to be uncovered. 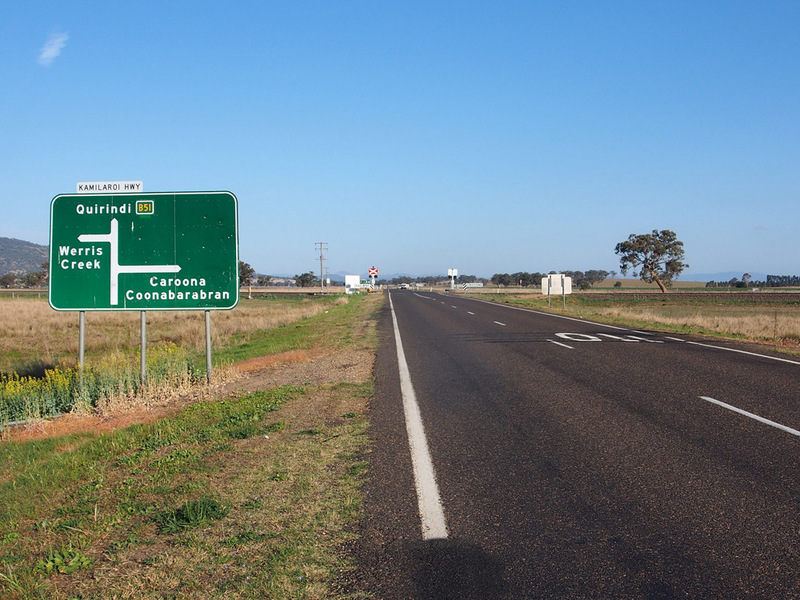 AD sign northeastbound on Newell Highway approaching the junction with Kamilaroi Highway, Narrabri West. 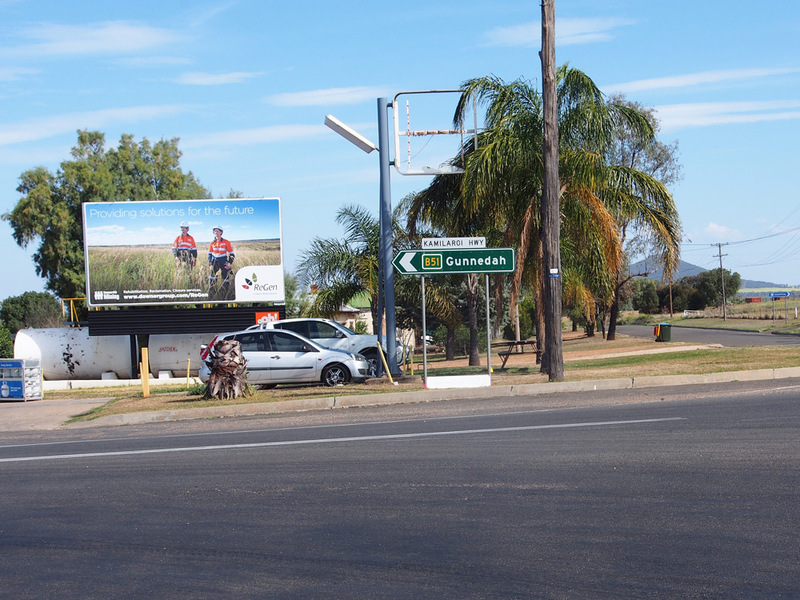 AD sign southwestbound on Newell Highway approaching the junction with Kamilaroi Highway, Narrabri West. The National Highway Route 39 coverplate is struggling to contain the A39 route marker beneath.